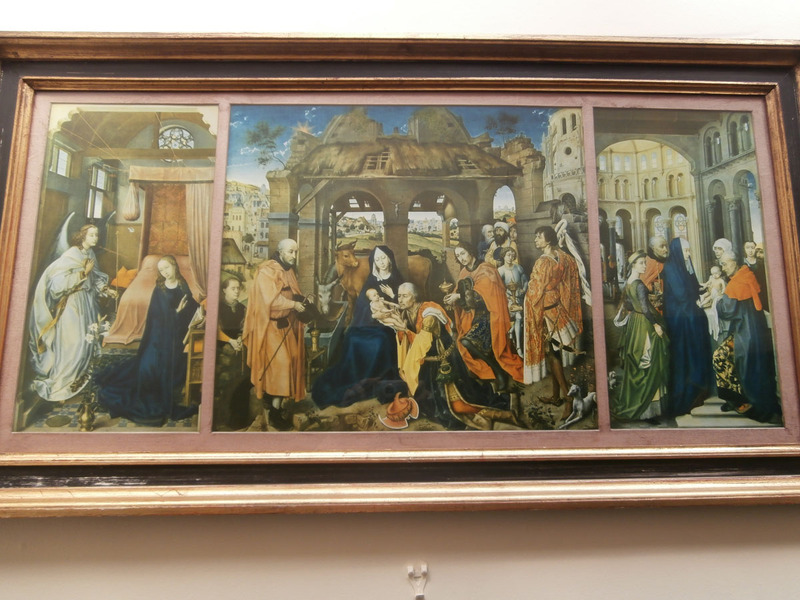 The Roger Van der Weydon Adoration on the top corridor. 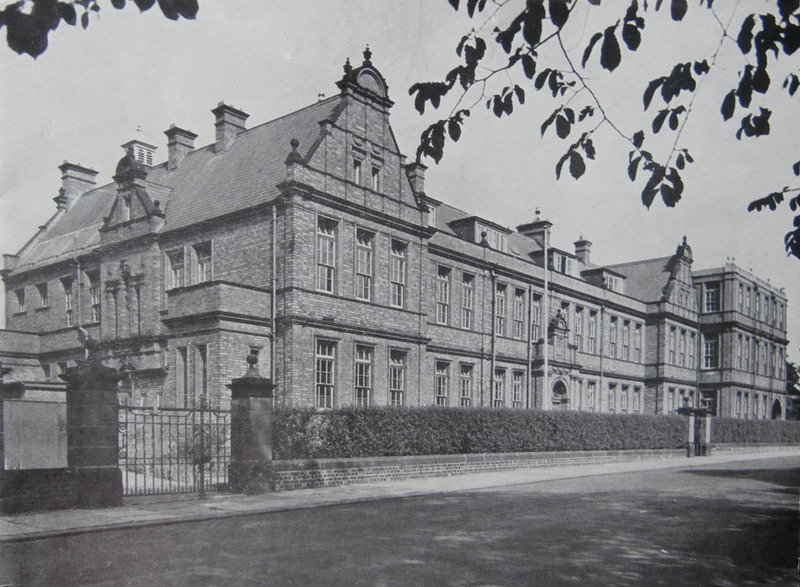 Deaconess Mary Siddall was the second Headmistress of Newcastle High School and it is typical of Church High that she was prominently remembered right up until the building closed in 2014, despite the fact that by then the picture had become just ‘part of the furniture’. 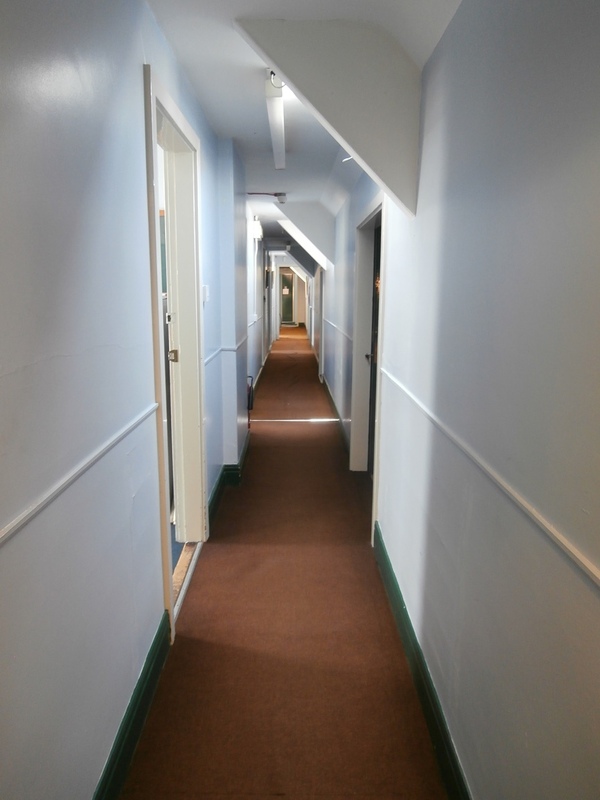 This area of the top corridor has only looked this way since 1954 when a third floor, allowing the creation of a long-awaited Library, was added to the flat roof of the 1933 two-storey north extension. If you look very closely, the join can just be detected in the brickwork, but only if you know what you are looking for. They did a good job. 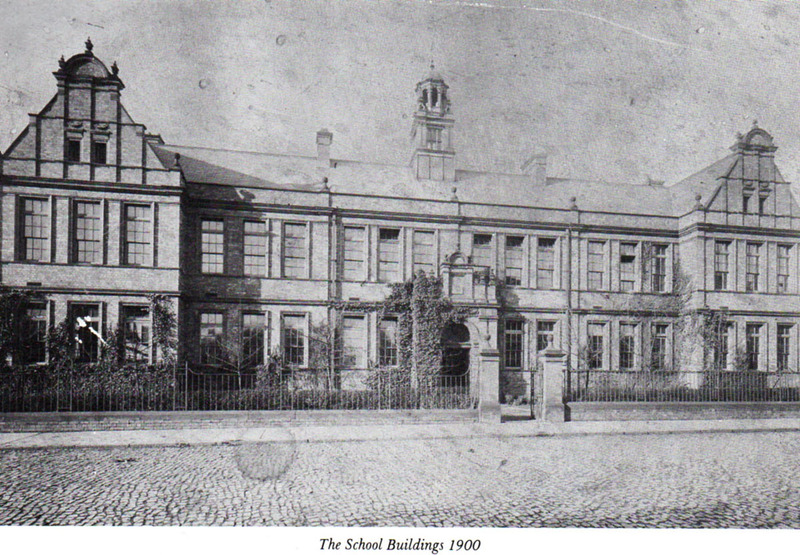 School Buildings, 1900, showing only the north gable-end. 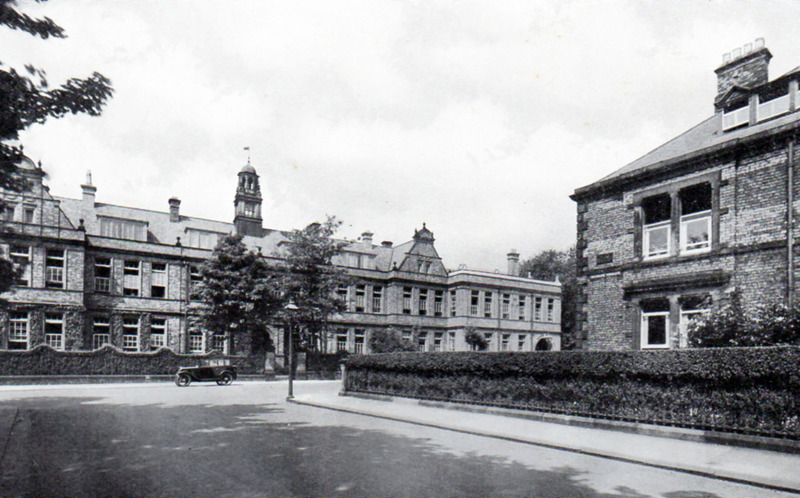 School Buildings with the two-storey 1933 north extension. School buildings with the 3rd floor 1954 Library extension. The Jubilee Book (page 40) describes the changes at the end of the main corridor to allow access to the new north extension at this level. 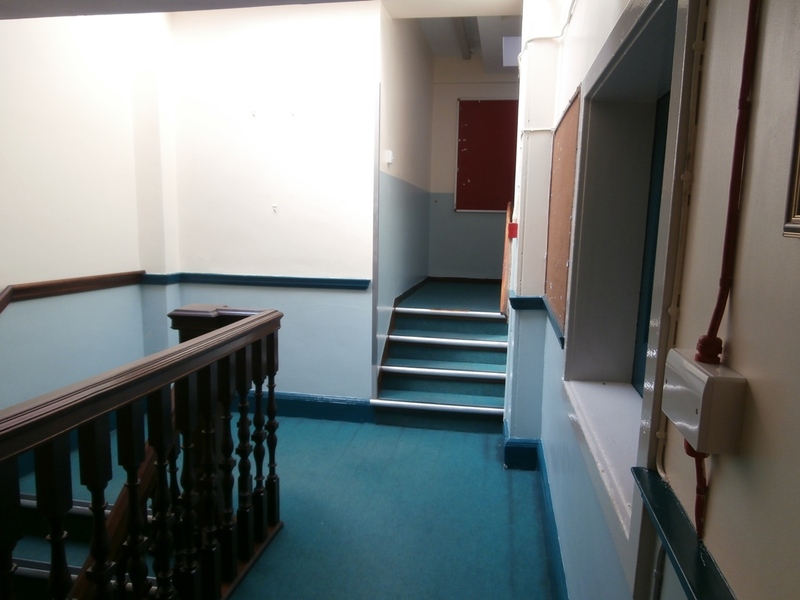 The landing space created for this purpose was virtually identical to the one added 20 years later on the top corridor I began by describing: ‘In place of the big window on the stairs, there is now a staircase leading up to a new staff room (the old staff room is now a form room), two new form rooms, a useful little room containing a sofa, the medicine chest, and a radiator, for the succour of invalids and the injured, some cupboards, and eventually a flat roof which is marked out for Tenniquoits, and which is designed to carry another room when, and if, this proves necessary. 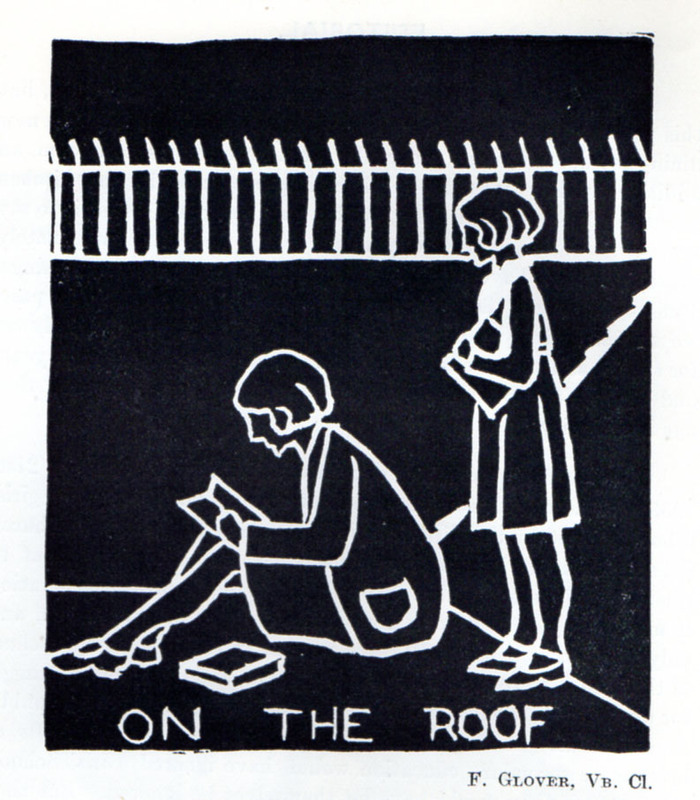 In the meanwhile it is a pleasant place for air and sun.’ The 1933-4 Jubilee School Magazine features a wonderful pupil’s black & white lino print showing girls enjoying the sun on the roof. Recreation on the flat roof, Jubilee Magazine 1933-4. 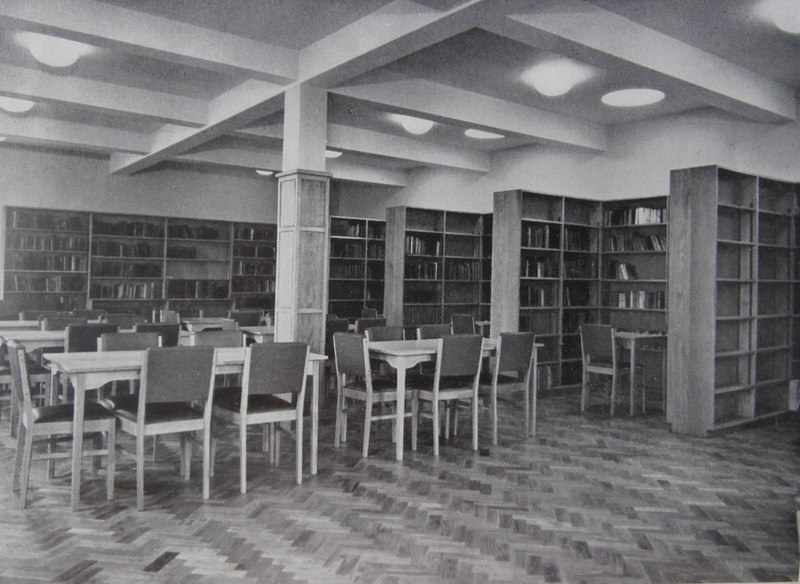 As the magazine for 1954 made clear, it was with great excitement that the Library was finally opened on the newly-created third floor of the north extension. There had been a Library Fund set up for many years previously and in 1949 a temporary library had been set up in one of the form rooms. The Centenary Book tells us that by 1952 Mr Clive Newcombe’s designs for the flat roof space had been accepted. 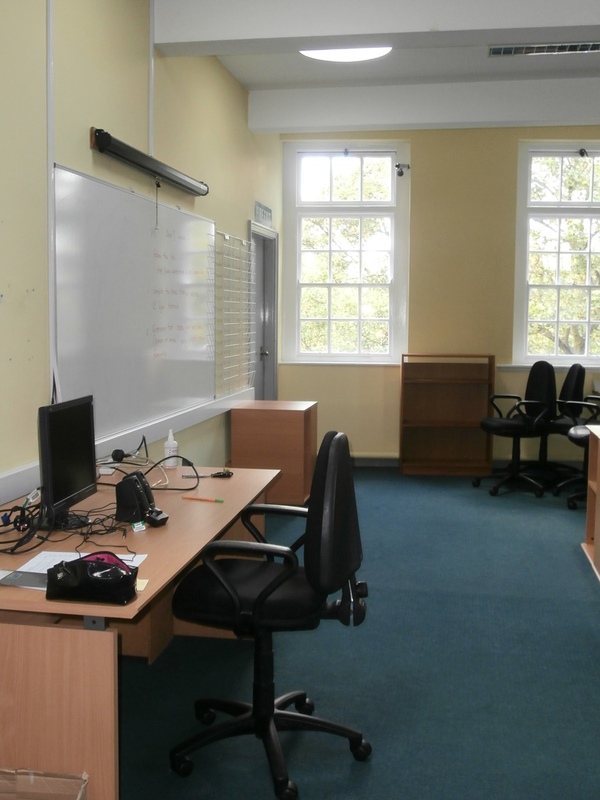 In addition to the Library, the design included a cloakroom [later to become Sickbay/IT Manager’s Office] and an Upper Sixth Form room [later the Careers Room/Staff IT Room]. It was opened on July 16th 1954 by Mrs Mildred Horsley, an Old Girl of the School herself and a very proactive Governor. 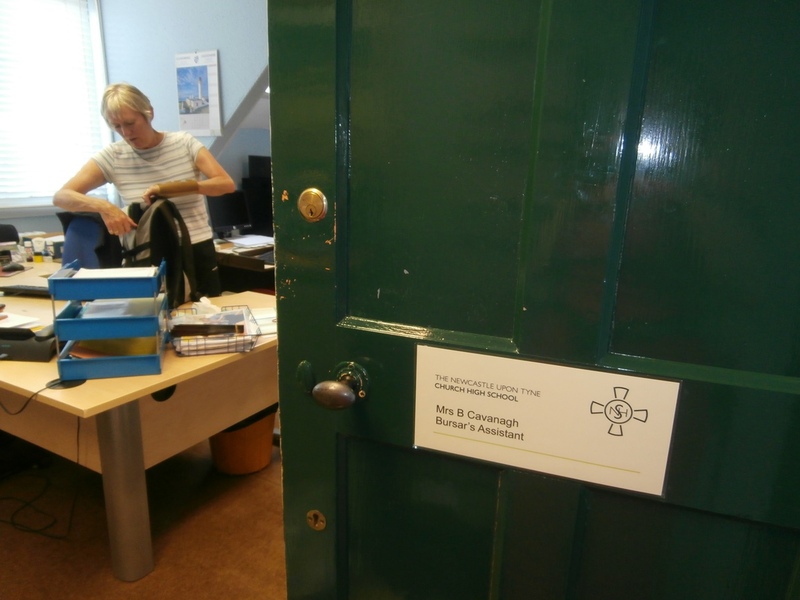 A wooden commemorative plaque remained in place until the ICT Suite arrived. 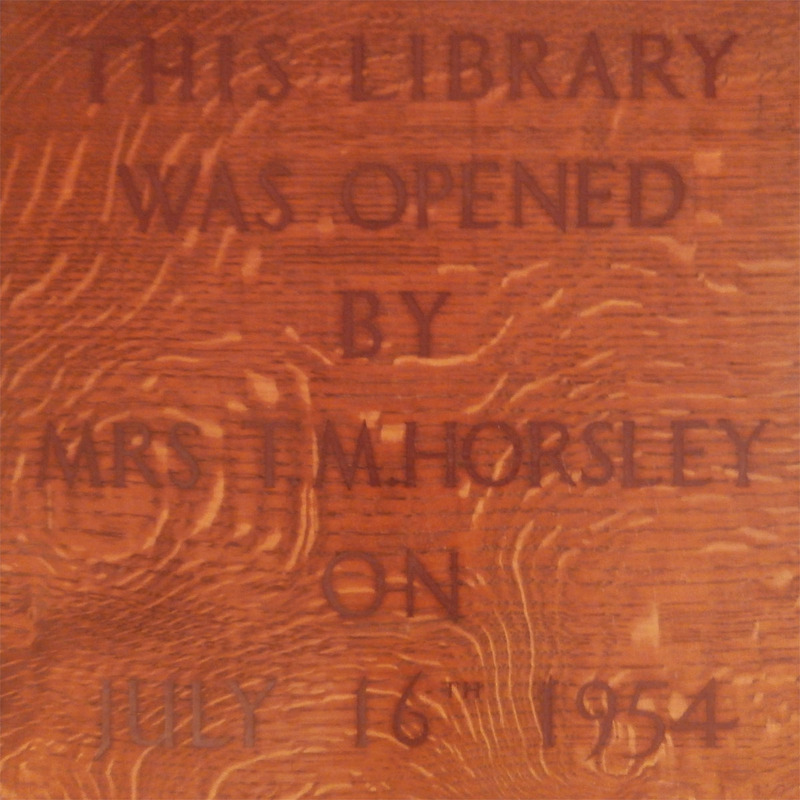 Plaque commemorating the opening of the Library extension. 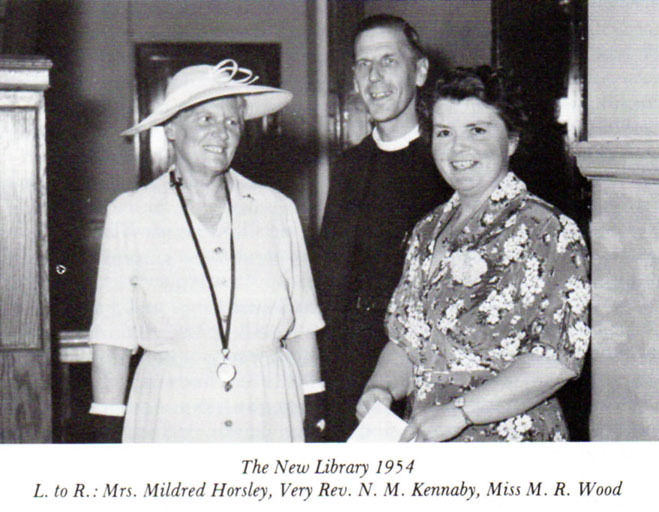 The Centenary Book records that ‘Before she performed the ceremony, Mrs Horsley told us that Deaconess Siddall had begun to dream of a library. Miss Gurney had given several bookcases. The Governors had made an annual grant towards library books. 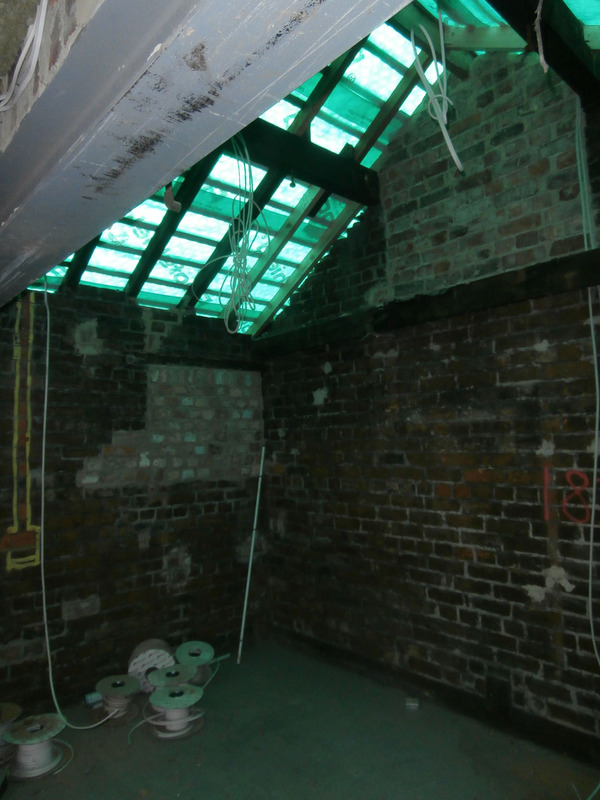 When Mr Newcombe designed the dining room and rooms above before the war, a flat roof was left as “an act of faith”. The war and the immense rise in building costs made it impossible to do more then, but the dream had been realised. Many gifts were given, such as a librarian’s desk, which Mr Nusenbaum had specially made, an oak table provided by Mrs Waterman in memory of the 15 years during which she and her husband had cared for the school, and an 18th century clock given by the Old Girls in memory of Miss Dickinson. To raise the money to finish paying for the Library, Old Girls, parents and the School worked for a year for a bazaar held on 23rd October.’ Quite clearly, the Library was then the pride of the School. The Library was a wonderfully atmospheric place. I remember well the parquet floor, heavy oak tables and the red leather of the seats contrasting with the wood of the bookcases lining the room’s walls. 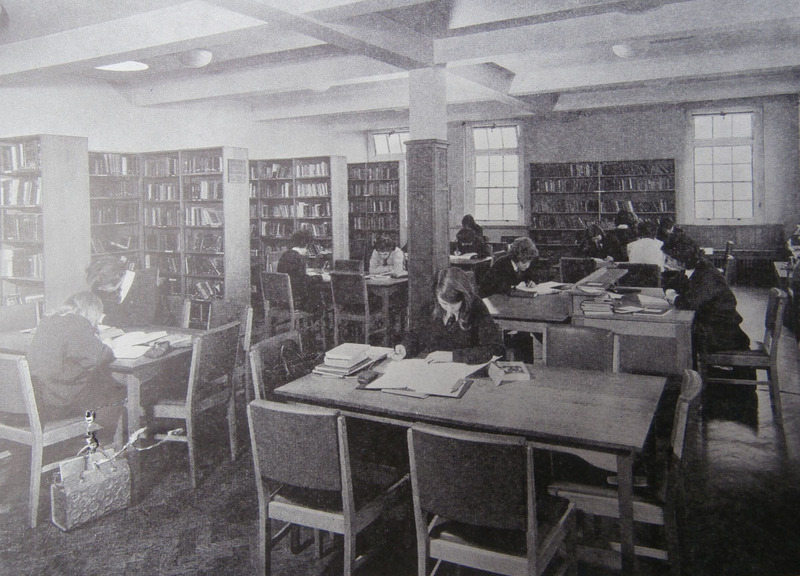 The School Library, top floor of north extension, 1954. The School Library in the 1960s-1970s. The vibrant School Library as I remember it in the 1980s. 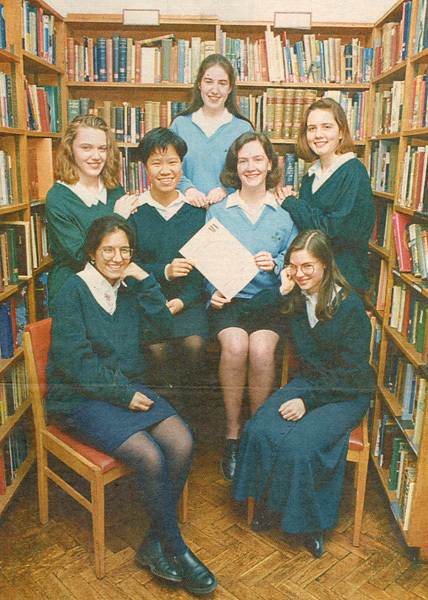 Prize giving photo shoot, Library, 1992. When I joined Church High in 1985, the book ruled, of course, and the Librarian was an ex-Maths teacher, the gentlemanly John Waite. 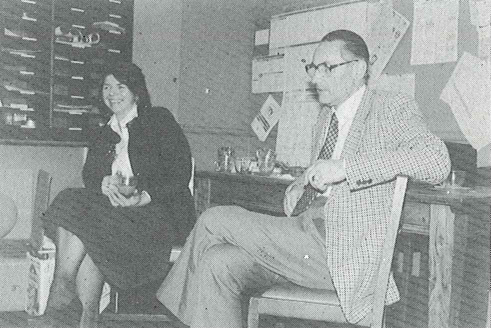 John Waite in the old 1980s staff room with Helen McLean. 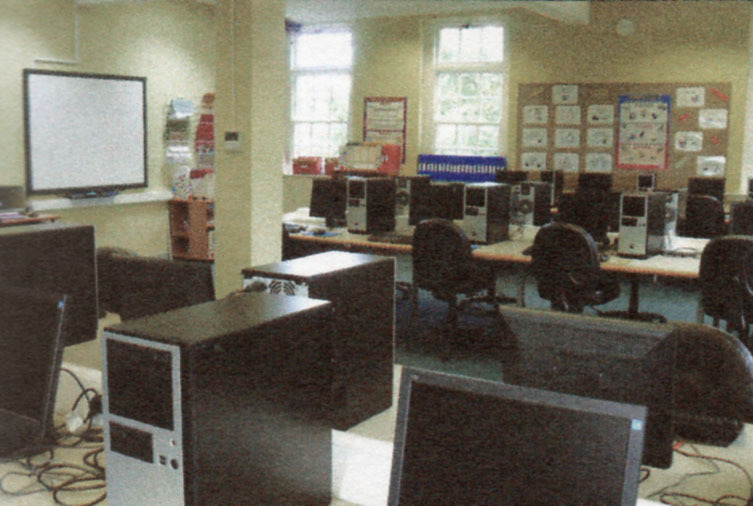 Computers had arrived at Church High by then – the School’s first Computer Club began in 1984 – but those first machines ‘lived up the road’, by the red letter box, on the top floor of Gurney House. Gurney House in the 1980s housed Home Economics ( Ground Floor), Art & Textiles (First Floor) and the Computing Department on the Top Floor. 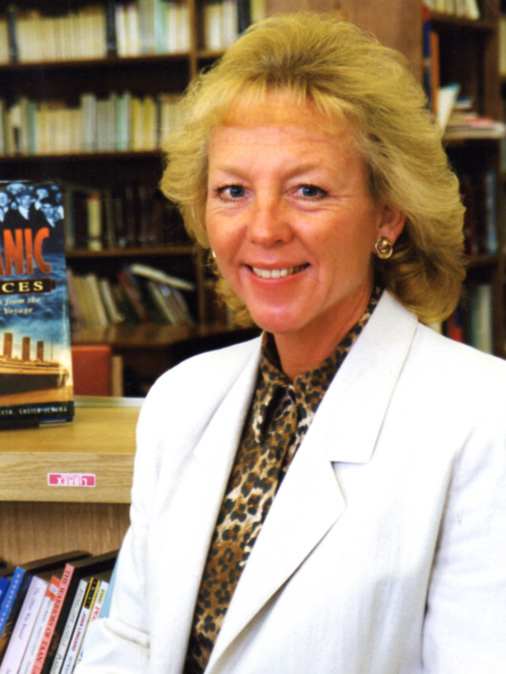 When John Waite retired, the Library became the realm of the genial Janice Fox for the next 10 years. Mrs Fox’s welcoming smile, humour and wonderful displays all added to the vibrancy of the space. Janice Fox tended the Old Library until 1999. 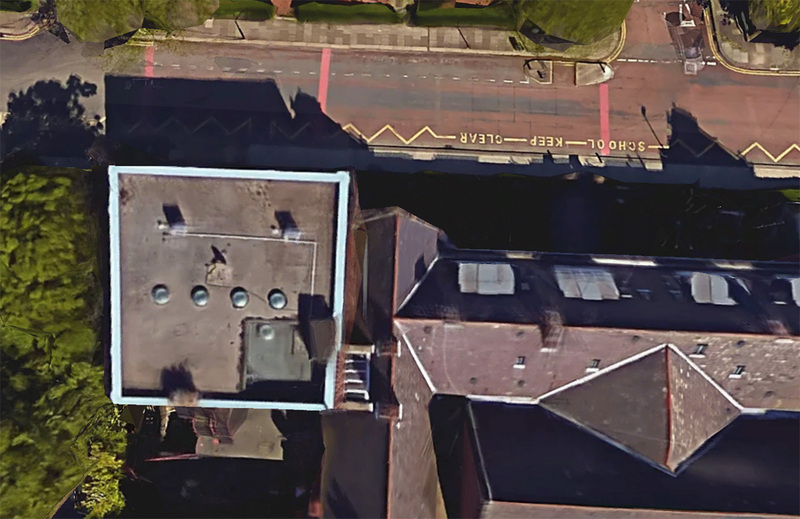 At the turn of The Millennium, there was a real sense of loss when the Old Library was dismantled and all the books transferred to a temporary residence in what was then known as Room 16 on the ground floor of Tankerville House across the road. 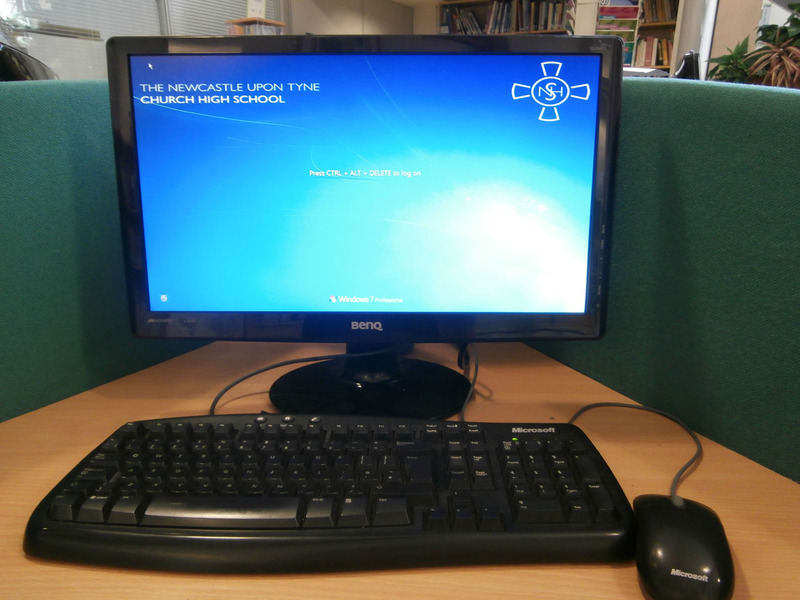 To fulfil Lesley Smith’s modernising vision for Church High, The New Century Challenge, the top north-east corner of the building was now destined to become a state-of-the art ICT Suite thanks to the new IT Manager, Steven Farrell. It’s hard now to remember it being any other way. 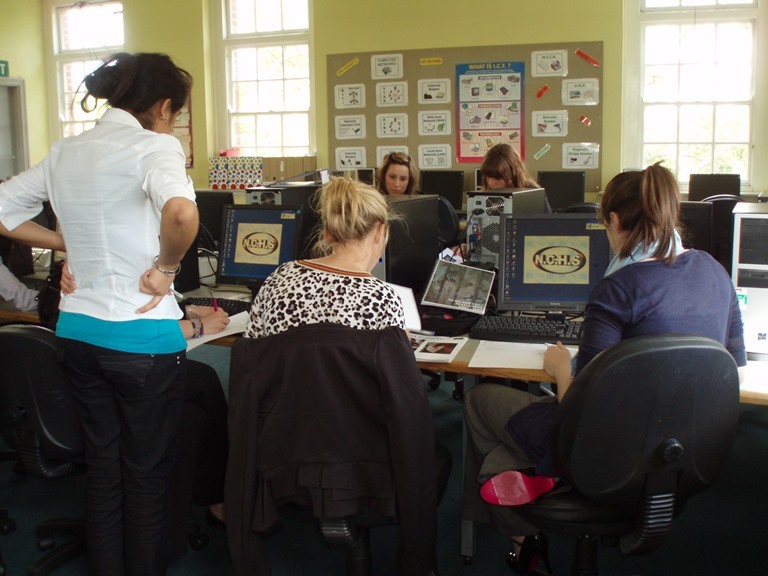 21st Century Girls in the new ICT Suite: ‘Computer Corner’. I have always loved the very top corridor of the Church High Main building. 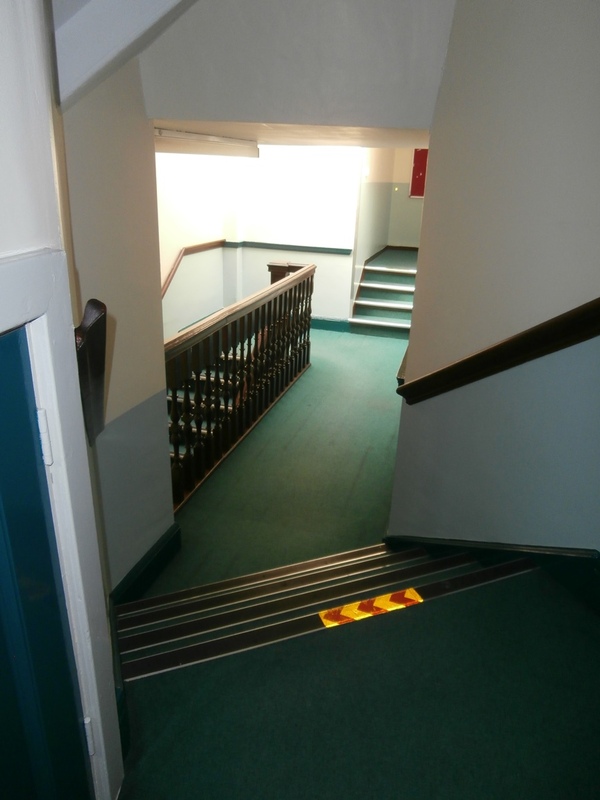 Those unmistakeable echoey school sounds which used to travel up the north stairwell from the main corridor below became muffled the moment the dark green fire-door closed behind you. I never lost the thrill that I was now walking through the roof eaves. 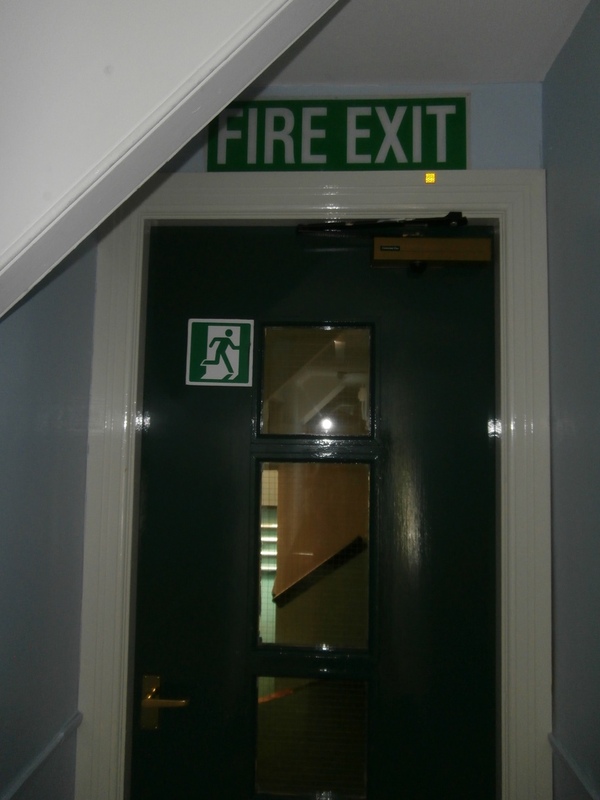 The forest green fire door on the top corridor. Perhaps it was the floor-to-ceiling sky blue walls or the fact that you could touch both sides of the passage way as you walked along, but it always felt very comforting to me up there. It’s only struck me very recently why it seemed so easy to feel at ease at Church High (something everybody who joined the school would comment on). With green at your feet and pale blue at eye level everywhere you went in the building, things always felt sort of ‘the right way up’. The colours mirrored nature. It’s how the world was meant to feel. The sky-blue walls of the top corridor always made me feel like I was walking in the clouds. 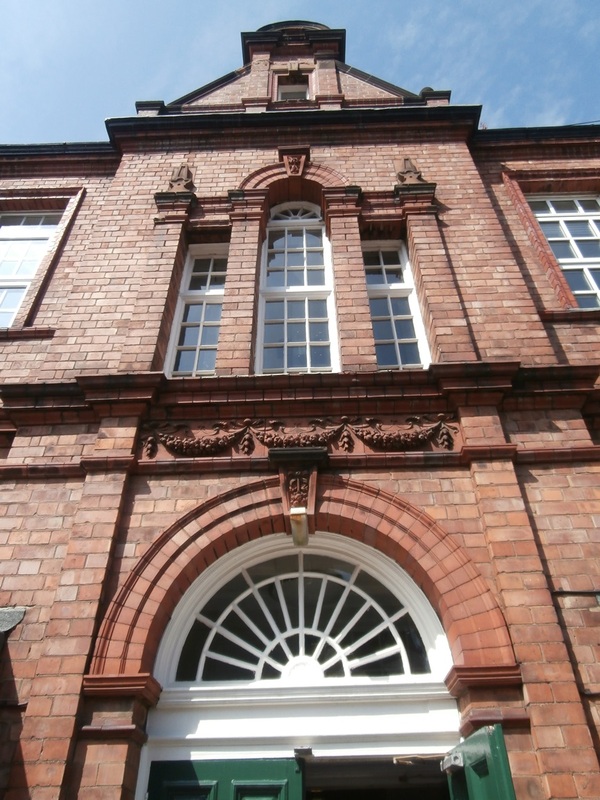 This area of School is first mentioned in the Jubilee Book when what we now know as the Dining Room and Staff Room block was added to the main building in 1933. 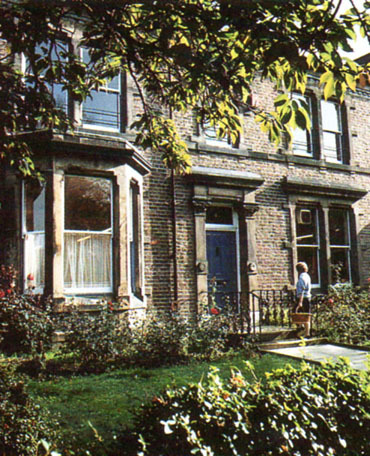 The 1935 history tells us that ‘extension at the north end was made possible by taking down the caretaker’s cottage (in place of which a flat has been built in the space under the roof).’ The caretakers at that time were Mr and Mrs Mattison and it would have been then that the four front dormer windows were added too – apparently none too subtly either, according to the present work-force. Most of the king posts were simply hacked out. 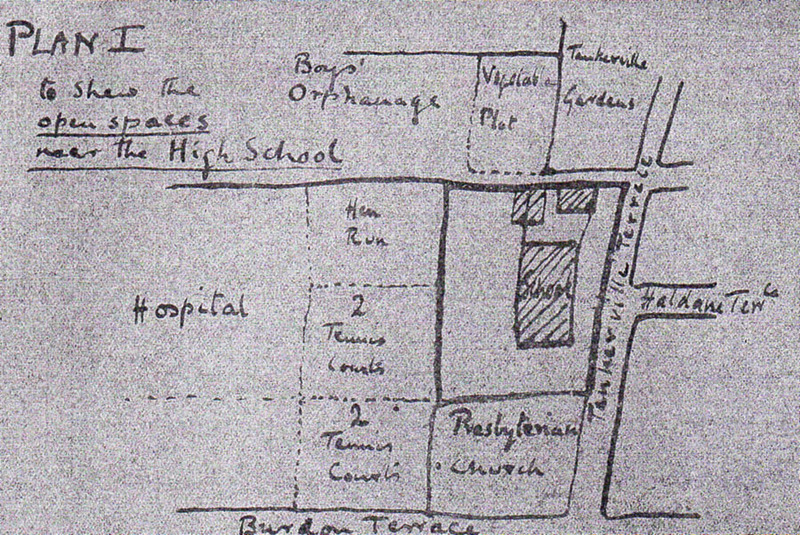 Miss Gurney’s hand-drawn plan of the Church High site in 1918 clearly shows two detached buildings, one of which was the Caretaker’s Cottage, at the north end of the School. [Miss Gurney’s ‘1918 Essay for the Governors’ is in the Church High Archive, Tyne & Wear Archives at The Discovery Museum]. 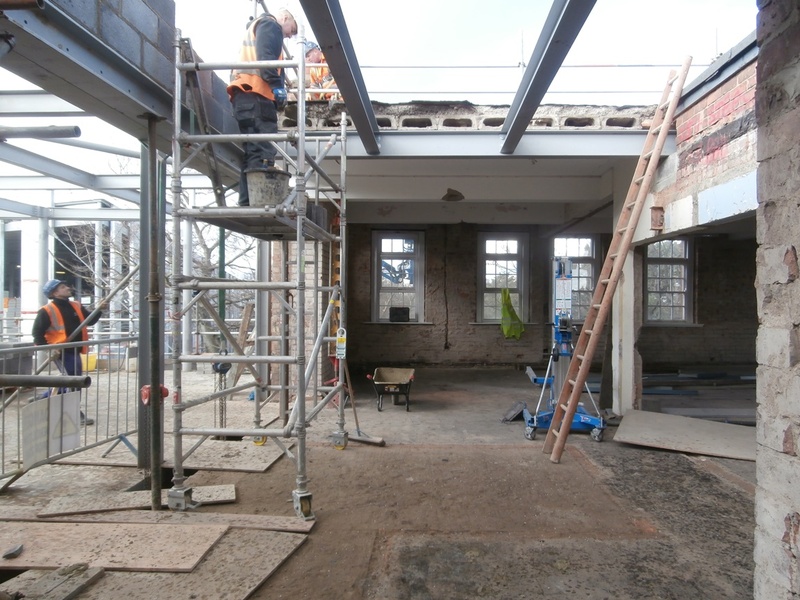 In later years, this space under the roof with its narrow corridor, sloping ceilings and small but characterful rooms would be adapted for Sixth Form use, as it will be once again when the renovated building reopens in September. Although I taught one or two S Level lessons up there as a young teacher, for most of my time at Church High I knew the lofty heights of the top corridor as ‘Administration Alley’, the hub of the school, which housed the indispensable folk. The Church High roofline with its dormer windows in 1951. Sadly, since the demolition of the north staircase – something I still find hard to believe was actually allowed to happen to an Arts & Crafts R.J. Leeson designed building – it’s no longer possible to approach this special space the way I’ve just introduced you to it. Instead, for a similar effect, we must use the existing south stairs. For now, the familiar blue-green paintwork is still there, but it won’t be for much longer, of course. The new school will be neutral. The south approach to the top corridor now. 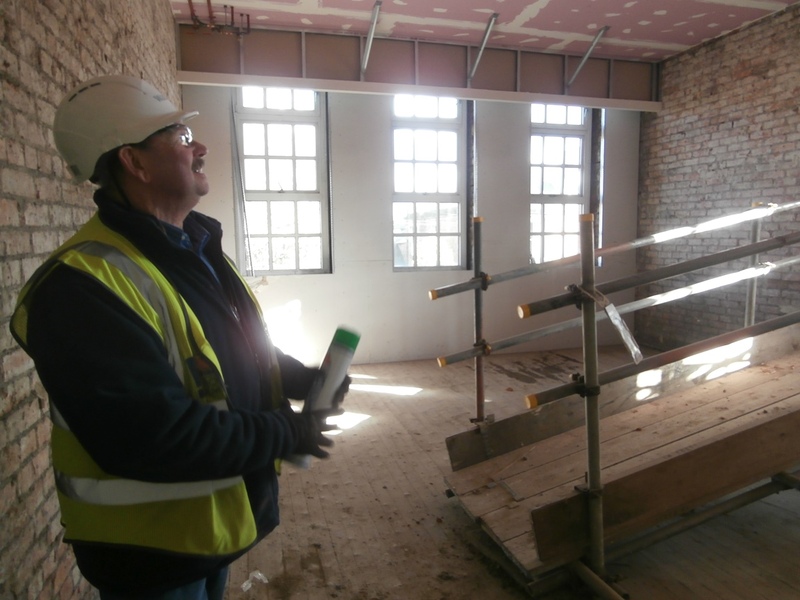 To our left is the room created in recent memory for the Head of Marketing, Head of Pastoral Care, Director of Studies and SENCO by lowering the ceiling of Room 8 (latterly a Maths room) below it. 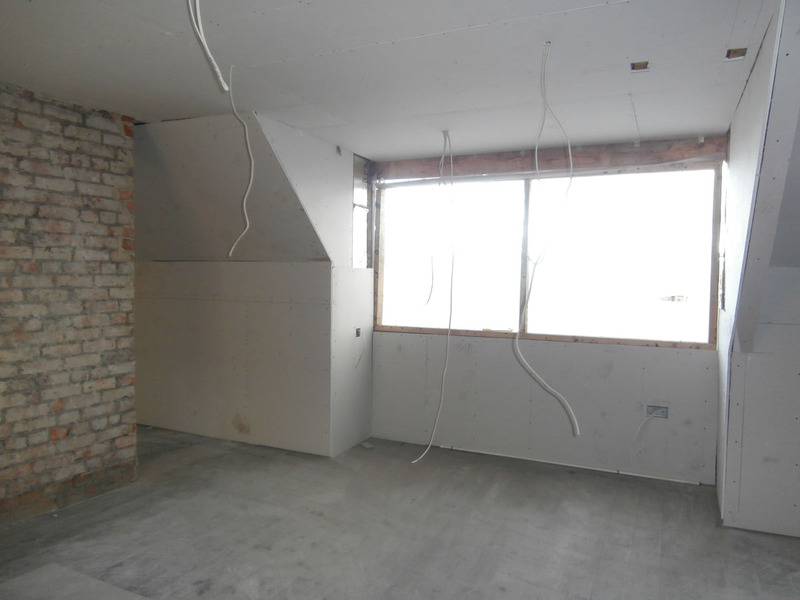 The most recently created room stripped bare. 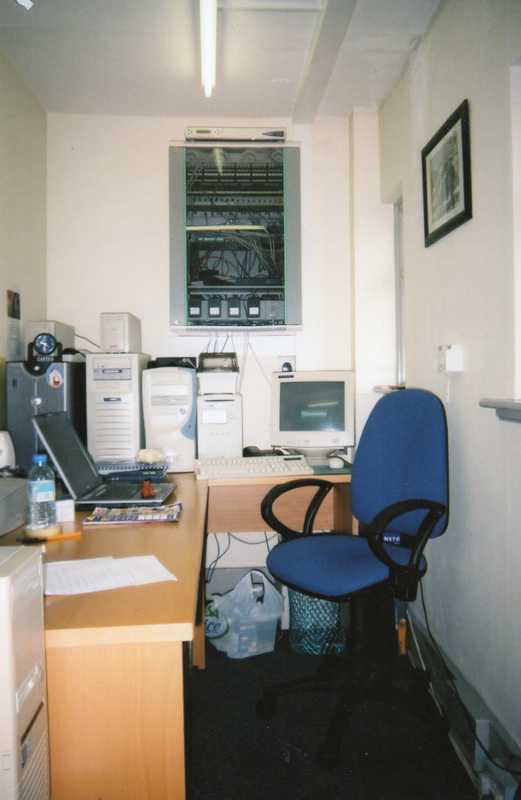 To our right, is the room initially created not too long after I joined the school for the storage of GCSE coursework and where David Cocallis worked most recently managing SIMS and data systems. 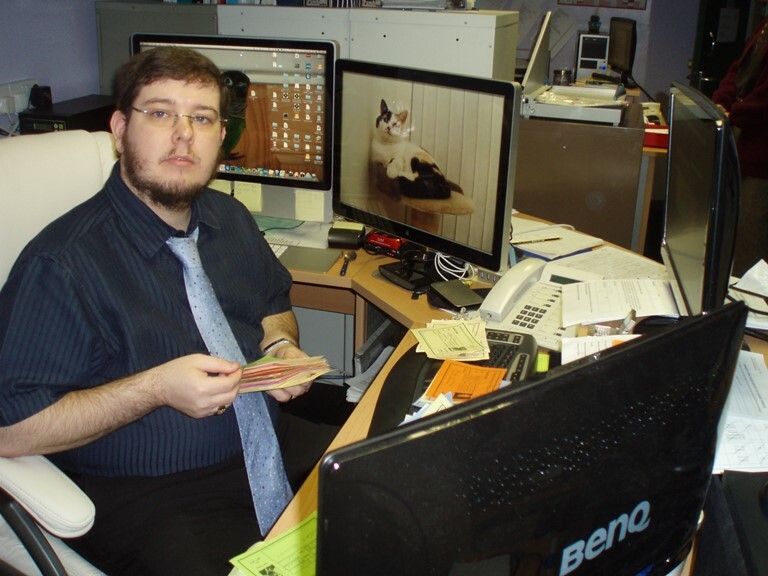 David Cocallis inputting NCHS House Points into the system. 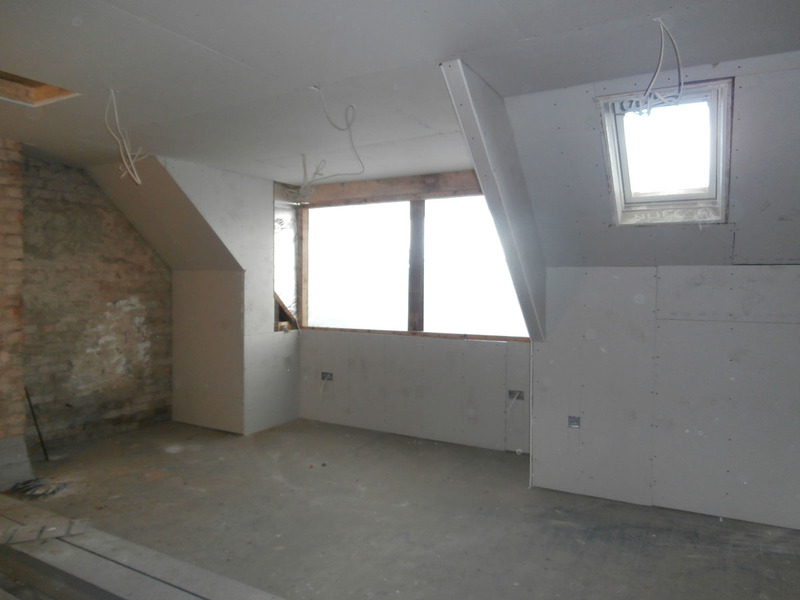 The same end eaves room as it is now; the parallel space on the north side contains the only existing king post trusses. Once up the step and through the doorway, although the dividing walls are all now knocked down, the corridor can still be made out down the left-hand-side if you knew it was there in the first place. The top floor as it is now from the south end; the corridor can still be made out on the left. 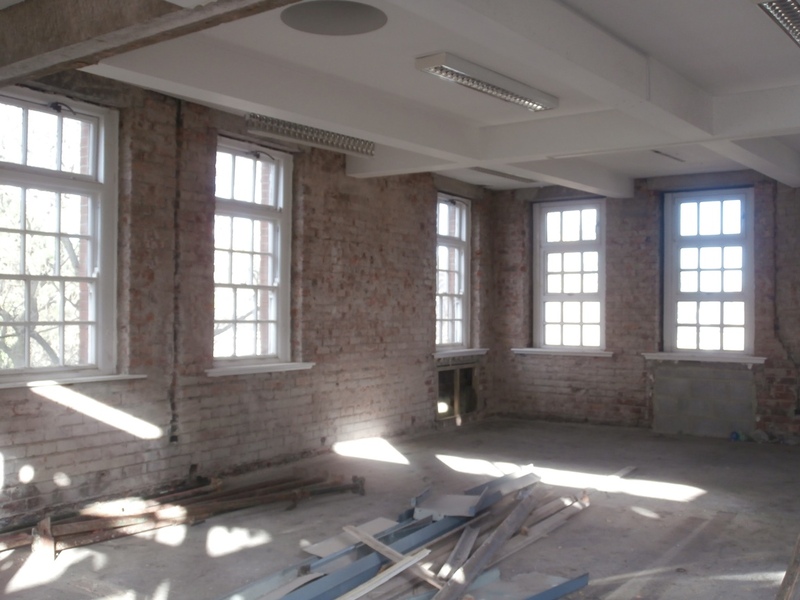 On the top floor, the offices were on the east side of the corridor with the smaller eaves spaces on the west side used for storage. From the south, the first office you came to on the right- a room I remember once being a classroom – belonged to the Deputy Head. I served under three Deputy Heads at Church High: Gillian Willett, Yvonne Fleming and from the late 1990s to 2014, Alison Roe. I knew Alison initially as a Geography teacher, then as Head of Geography, as my Director of Studies and finally as Deputy Head. By 2014, Alison had devoted 34 years’ service to Church High. 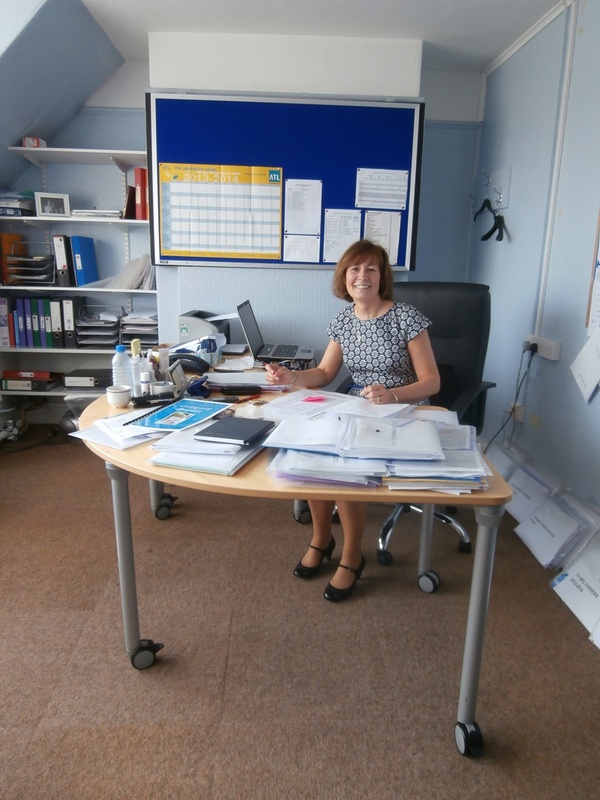 Deputy Head, Alison Roe, in her office, 2014. 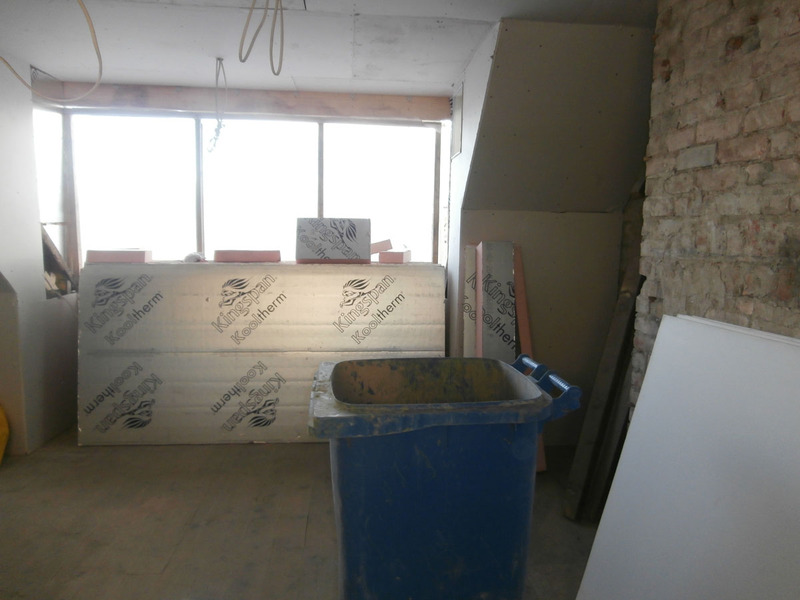 The same space now in the process of being boarded out. 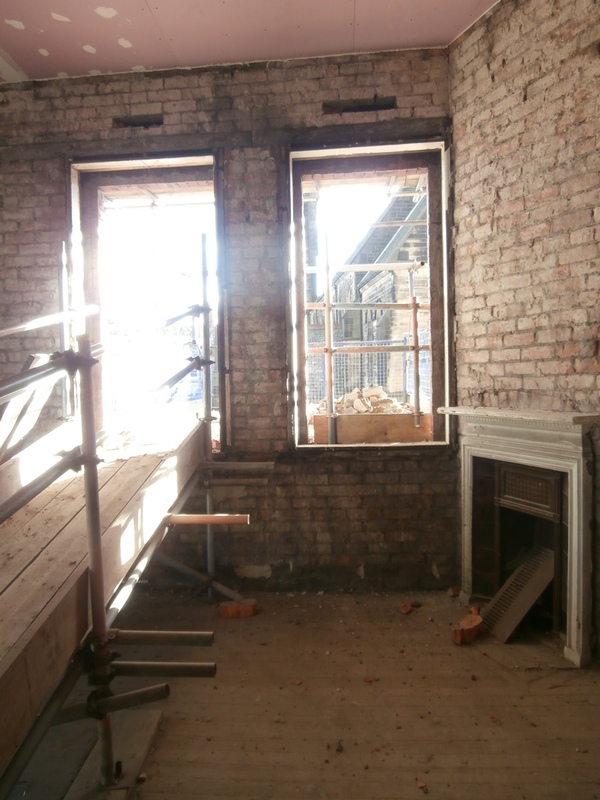 Earlier in January when the original fire-place was discovered. 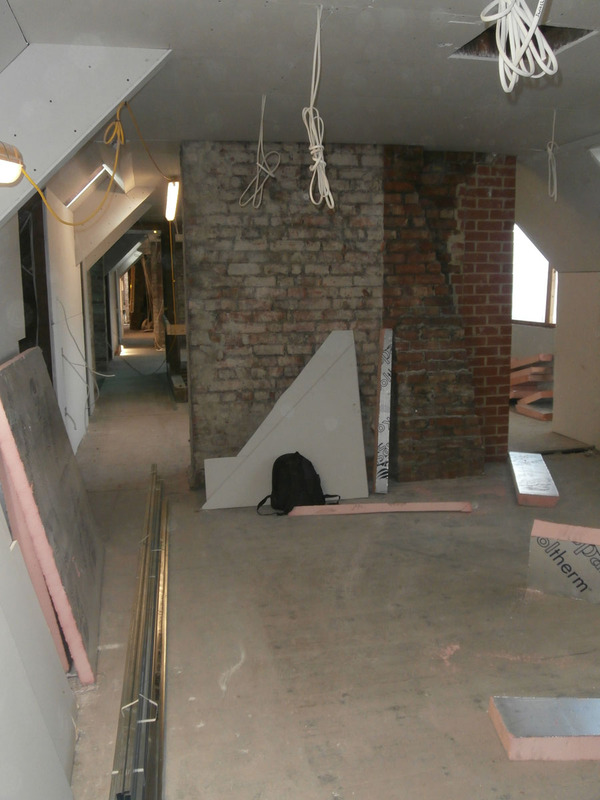 The space behind the next dormer window in the roofline was divided between the Staff Gentlemen’s toilet with changing area and the Alumnae Office, home to the multi-tasking Sarah Timney: NCHS Old Girl, parent of two Church High daughters, teacher in both Junior & Senior Schools and finally Events and Alumnae Co-ordinator. Sarah used her detailed knowledge of Church High and artefacts from the Alumnae Archive to create an illustrated Timeline History of the School for the final ‘Heritage Edition’ of the School Magazine. 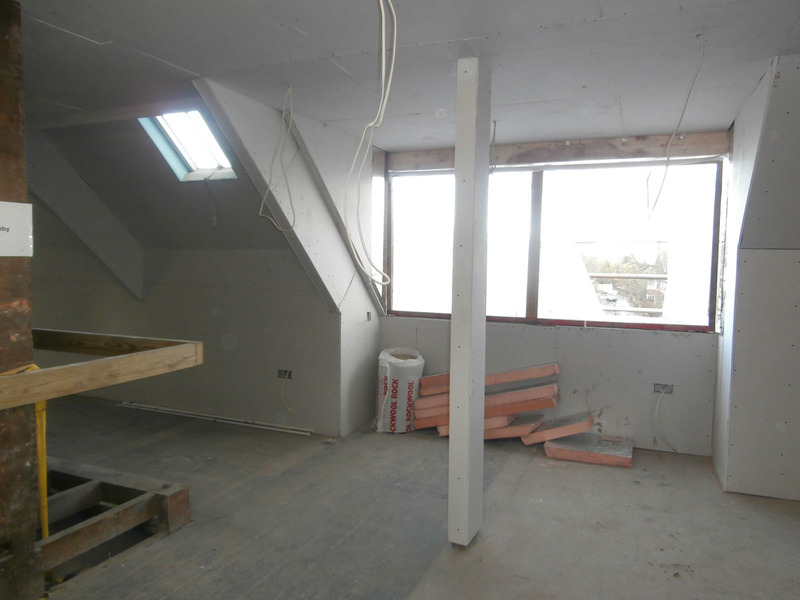 The area behind the second top floor dormer window now. 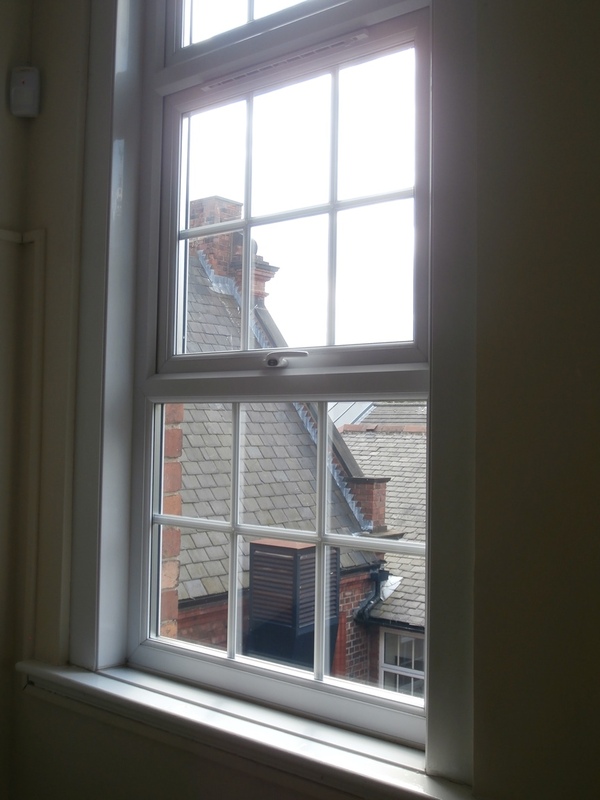 The south section of this window used to let light into Sarah Timney’s Alumnae Office. 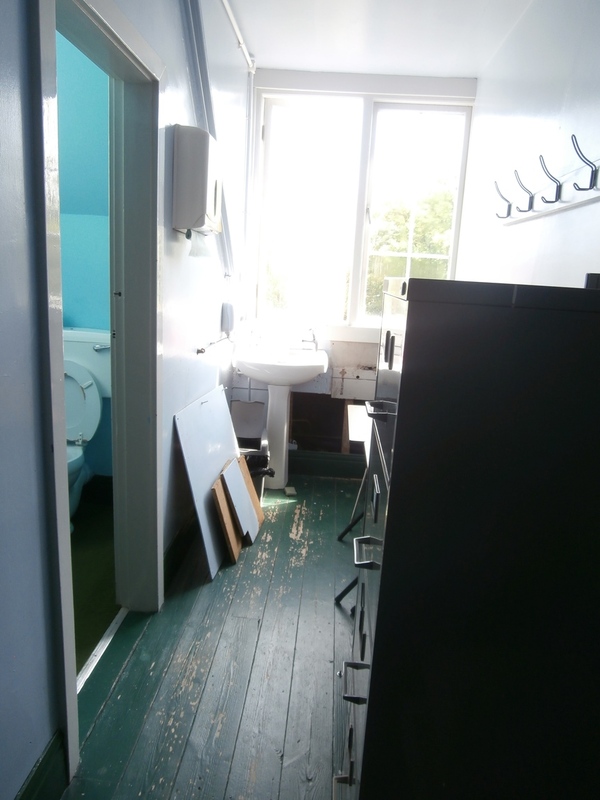 The north section was much less salubrious: the Staff Gents toilet and washroom/lobby. 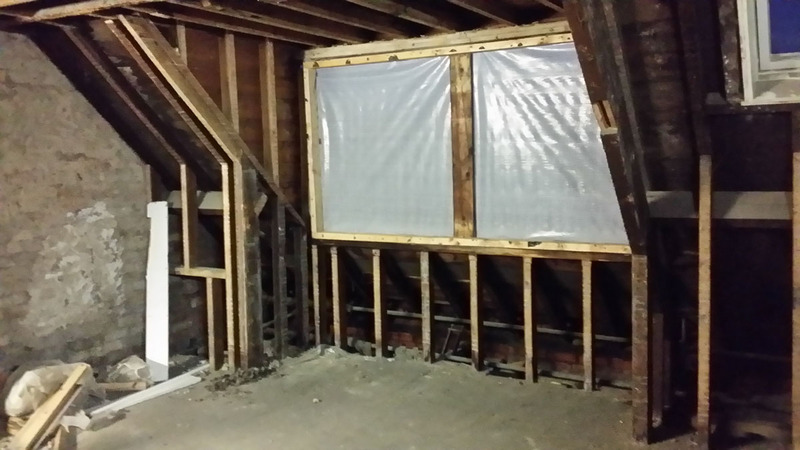 Before the third dormer window, an intriguing wooden structure has now been exposed. 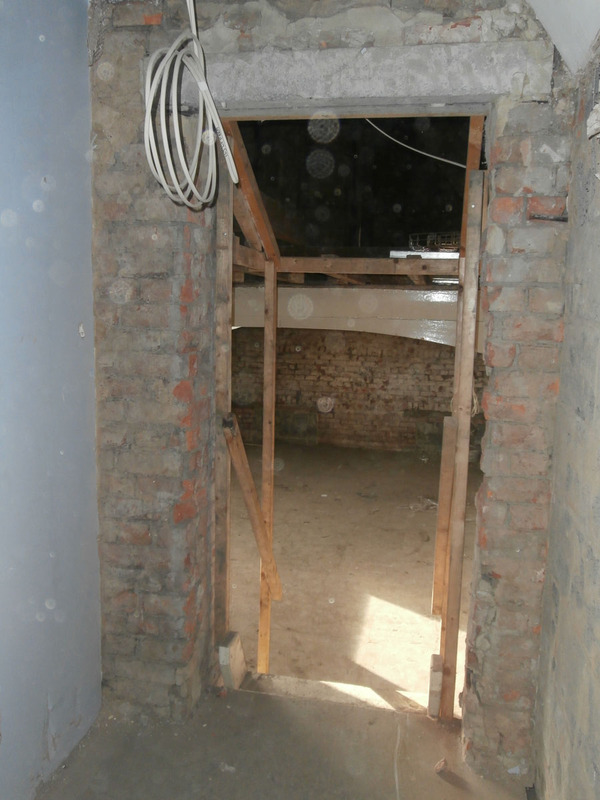 It was an unexpected find and Wates were going to knock it down until they realised it was structural. I had an idea what it might once have been the moment I saw it, and I have subsequently been proved right, but that’s the subject of another post. It now seems this must have been our Alumnae Archive store. 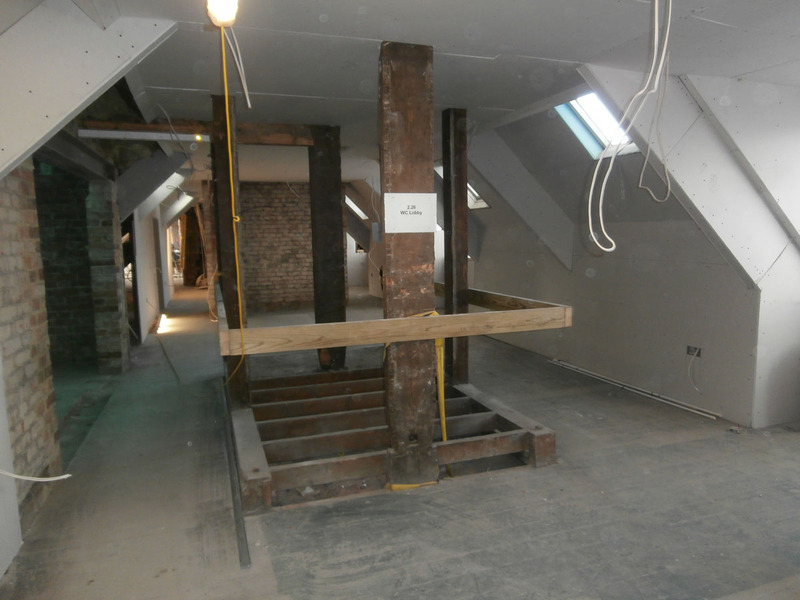 This large exposed wooden structure now marks the site where the Alumnae Archive cupboard on the top floor used to be. I always wondered why you had to step up into it. 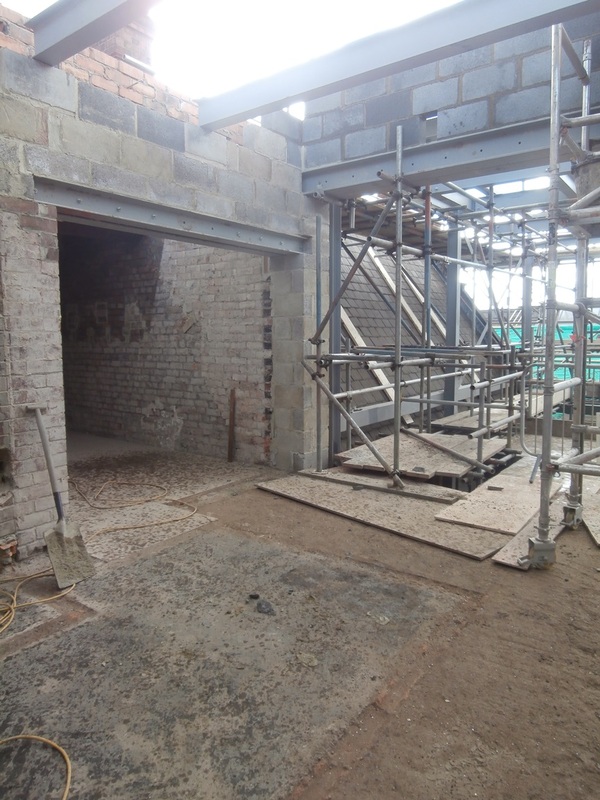 The next room on the right, the third dormer window, has been the Bursar’s Assistant’s Office since 2001/2. 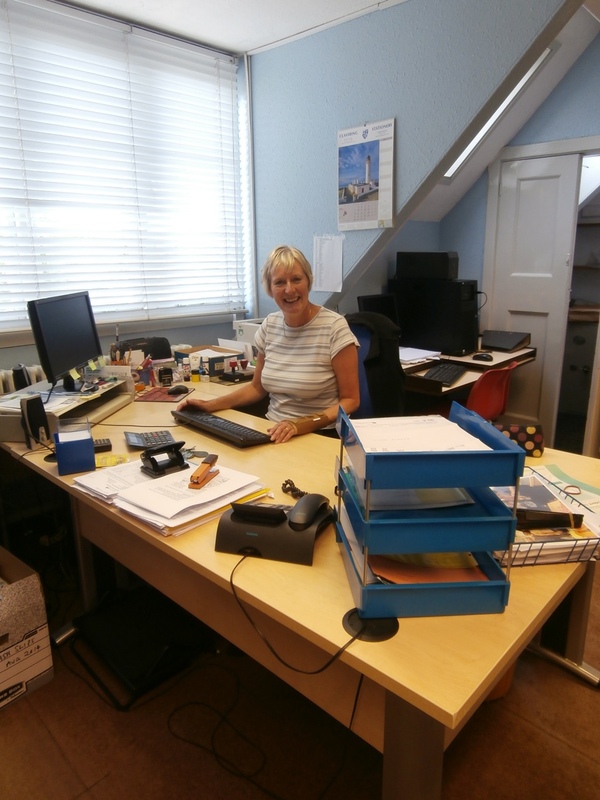 It has always housed the School safe in a strong room behind it and, for the last 17 years, it was ‘home’ to the indefatigable and ever cheerful Brenda Cavanagh. 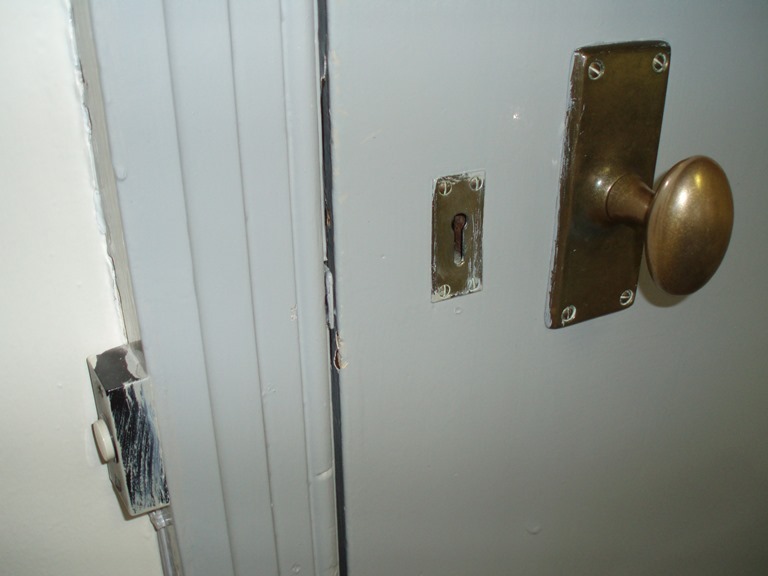 The familiar green Bursar’s Assistant’s Office door in 2014. 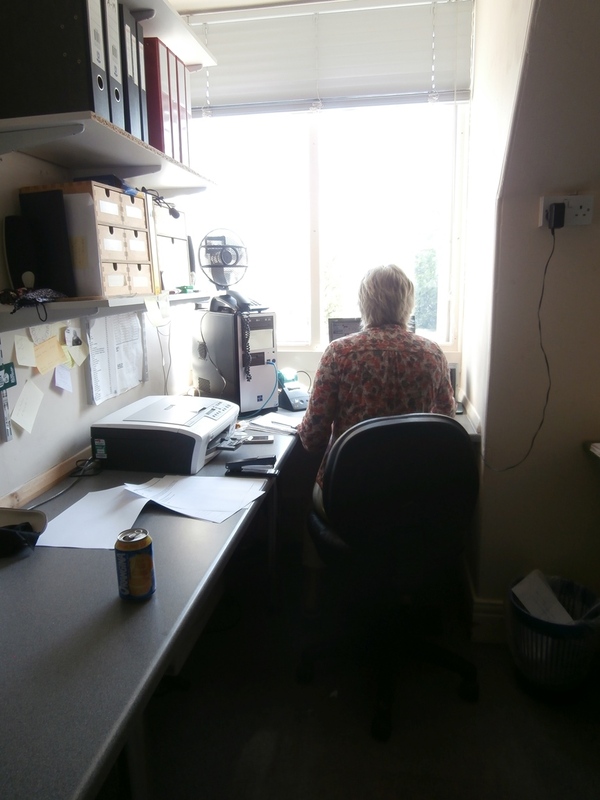 Brenda Cavanagh in her office as we knew it. 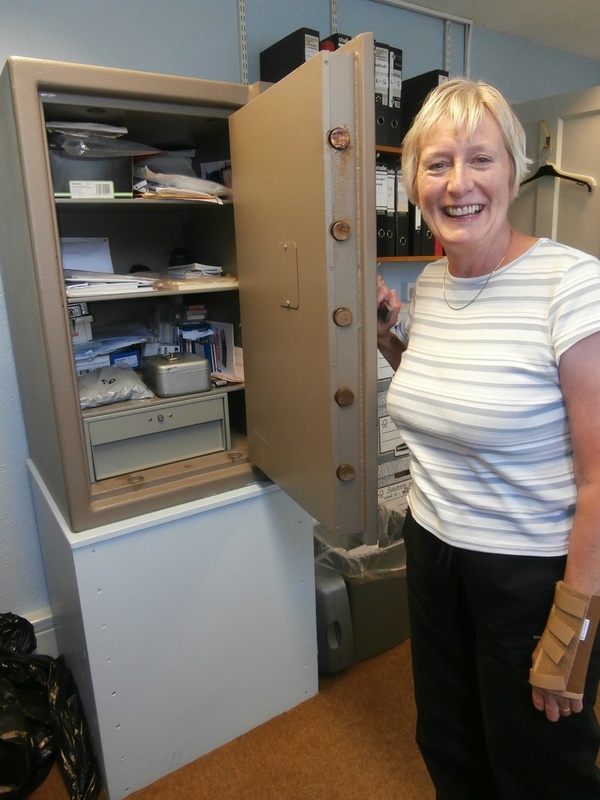 Brenda, guardian of the NCHS safe in 2014. 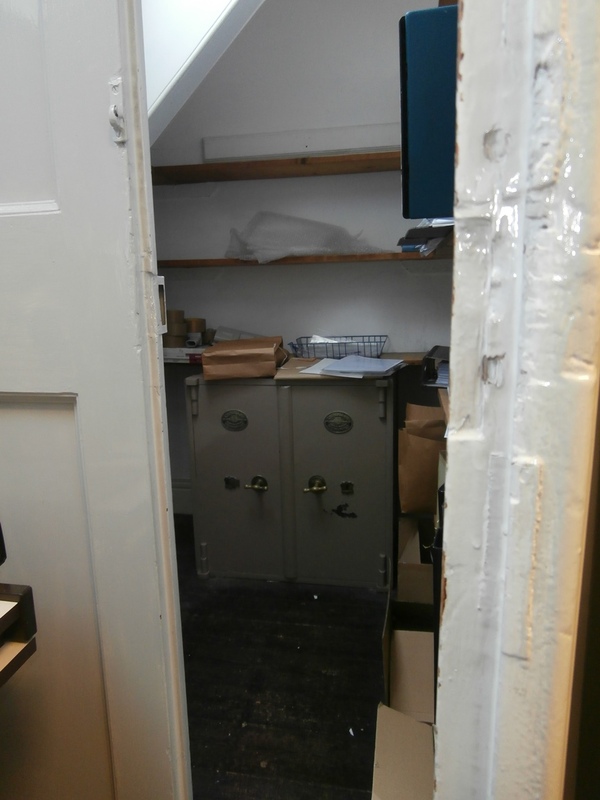 An even bigger safe was kept in a secret room. 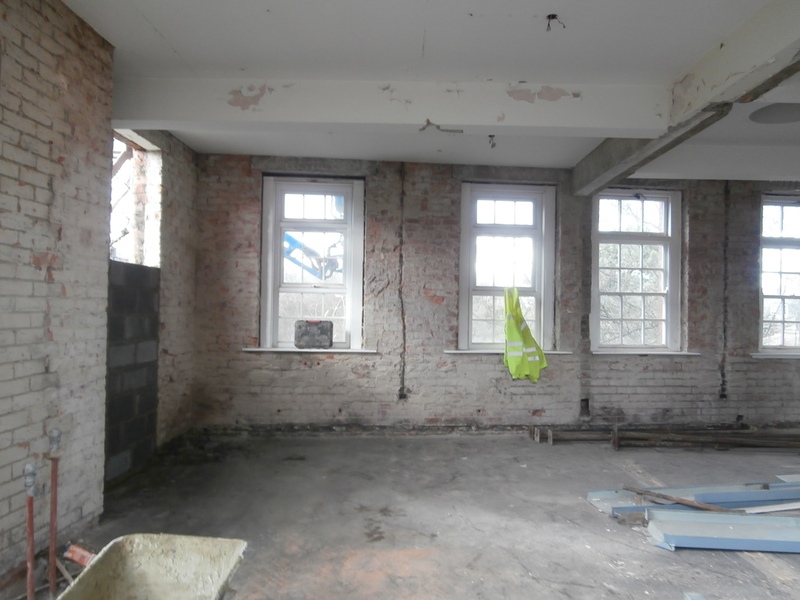 Strong room area & Bursar’s Assistant’s Office, January 2016. 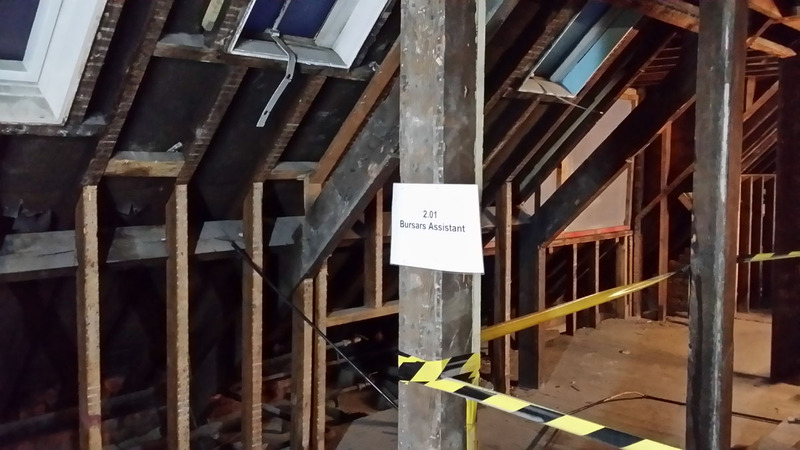 Strong room (behind Alumnae cupboard), February 2016. 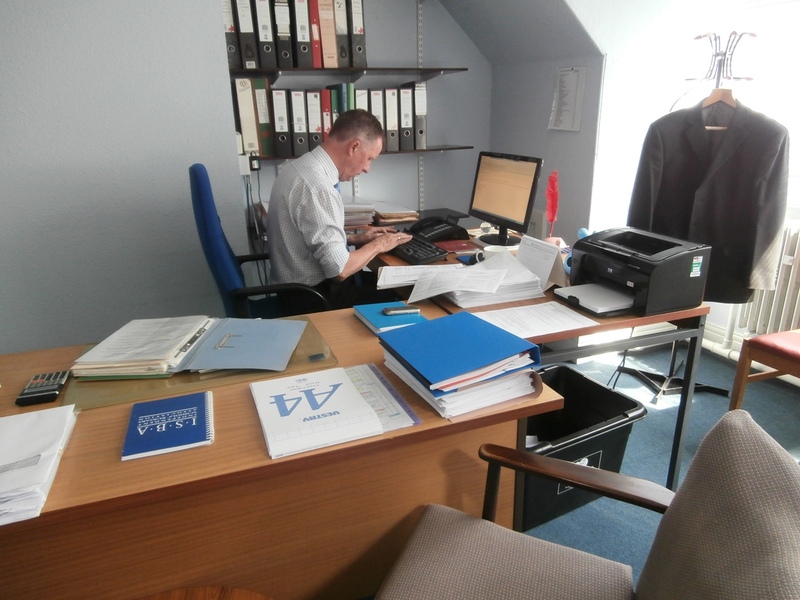 The Bursar’s Assistants Office, February 2016. 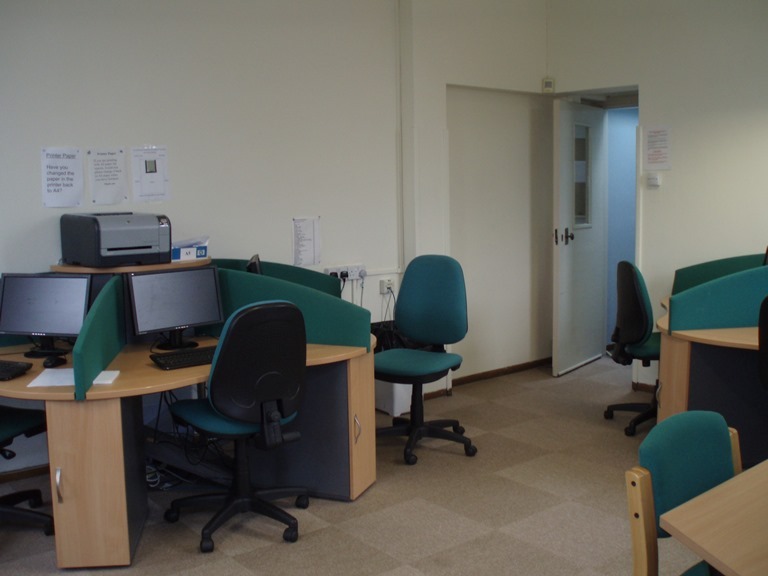 The room behind the last dormer window (the first office you would come to on the left if you entered the top corridor at the north end), has been the Bursar’s Office since 2001/2. 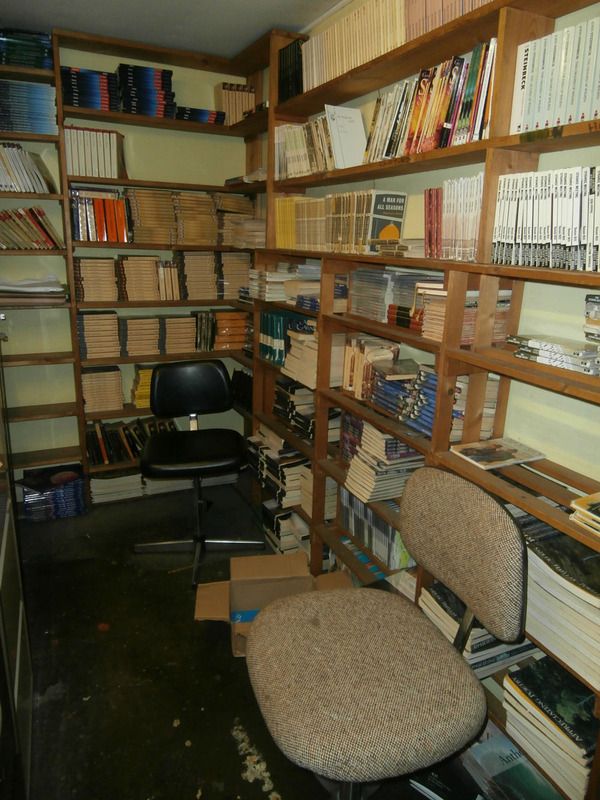 Before then, the Bursar and his Assistant shared the room next door and this space was the English Department book cupboard which was moved into a smaller space nearby in the west eaves. I knew three Bursars in my time at Church High: Geoffrey Doxford, Dorothy Ratki and finally Peter Keen, who ably managed the Church High finances & buildings, as well as being Line Manager for all NCHS Support Staff, for 21 years. The Bursar’s Office and the 4th dormer window as it is now. 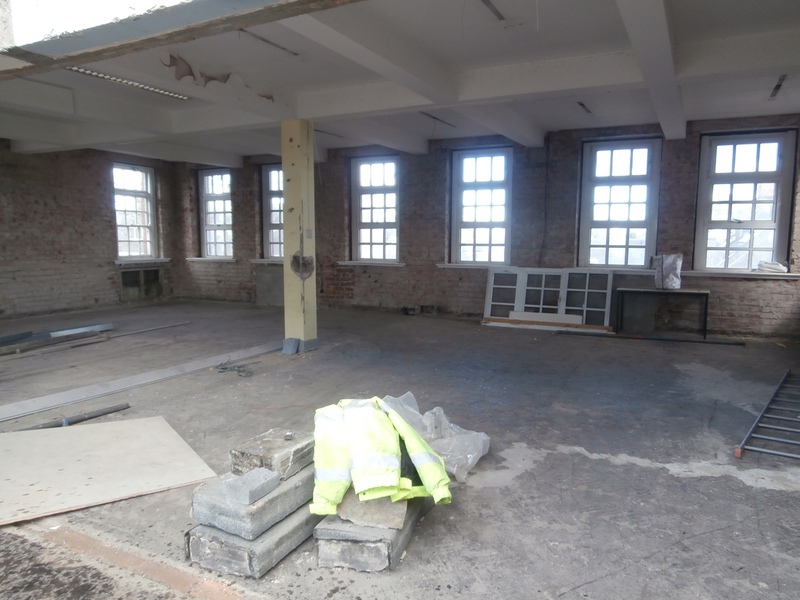 The same space in its stripped down state in January 2016. And as the home of Peter Keen as we remember it in 2014. The relocated English Dept. book cupboard in the west eaves as we saw it last in 2014. The same space as it is now in February 2016. It’s hard to encapsulate the exact ingredients that made Church High such a special place and a very happy working environment; life there certainly wasn’t exempt from its everyday ‘ups and downs’ over the years. Nonetheless, I worked there extremely happily for 29 years and would have continued to do so. I know I wasn’t alone in feeling this way either. 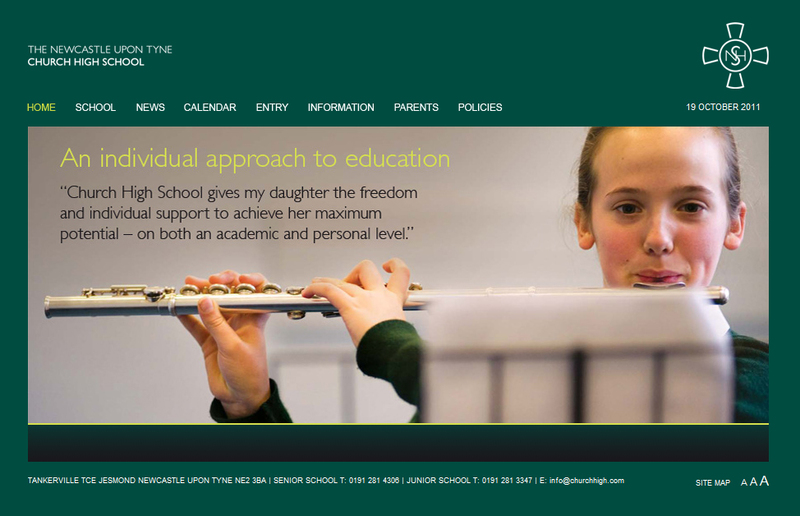 In its 129 year history, the School has had only twelve Headmistresses. During the war years, their tenures, understandably, tended to be short. However, four Heads guided the School for more than ten years and it is these ladies who really left their mark on the School. I count myself very lucky to have served under and learned from two of them. Mrs Lesley Smith was Head for 12 years (1996-2008); Miss M.R. Wood [latterly Mrs Pybus] for 20 years (1945-1965); Miss Patricia E. Davies for 22 years (1974-1996). The School’s most influential Headmistress was undoubtedly Miss Louisa M. Gurney, who served for 34 years in total and actually increased numbers during the First World War. An Old Girl like Sarah Timney, from 1886-1937 Miss Florence Dickinson was also connected to the school for decades as pupil, teacher and, ultimately, an exceptionally well-loved Deputy to Miss Gurney. 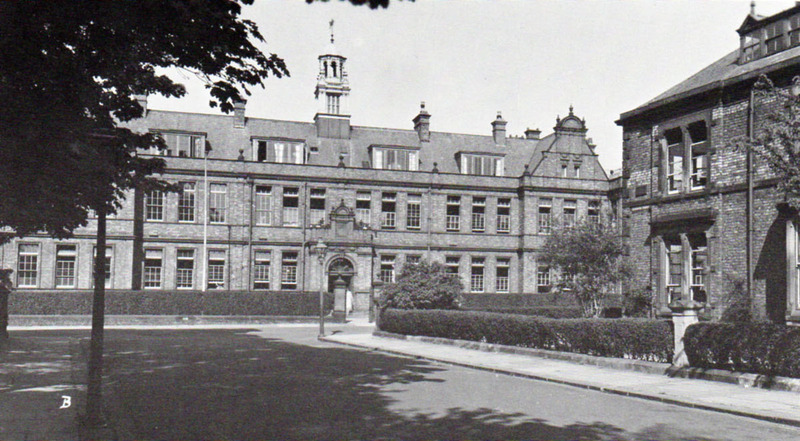 She started Newcastle High as a young girl in the Jesmond Road houses, confused by which door of the four was the main door, and taught at both Newcastle High and Church High for 38 years (1899-1937). 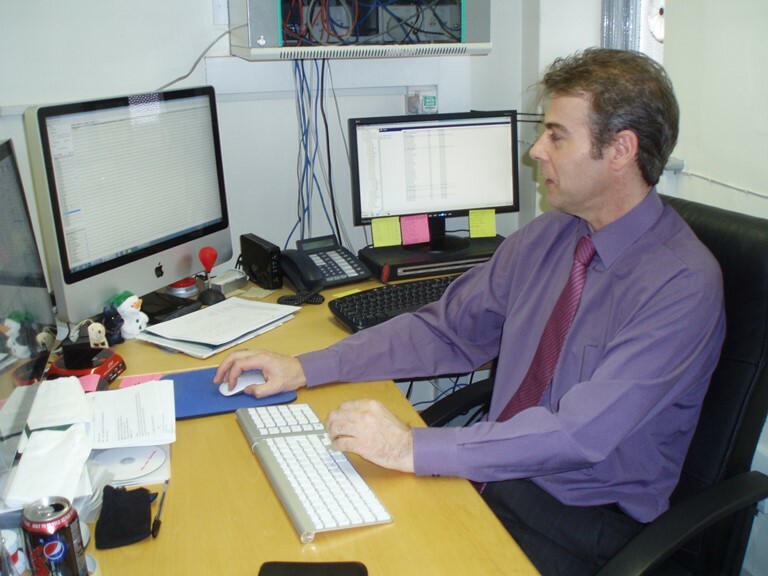 The Jubilee history makes it very clear that such records of long service are not just confined to the teaching staff, but also extend to the governing body and support staff too. The first caretakers, Mr & Mrs Waterman, stayed for 24 years and as we know from the staff mentioned in this post, this was not unusual. So it should come as no surprise to those who know the School that the people working in their offices on the top corridor tucked away in the ‘Space under the Roof’, had years and years of service to Church High between them. Nor that they kept School ticking over like clockwork. And I haven’t even got to ‘Computer Corner’ yet. The new extension now six weeks further on. Whichever end of Tankerville Terrace you approach it from, the pace of progress on the new build site is clear for all to see. As I’ve said before though, renovation work behind the brick façade of the old Church High main building is much harder to fathom. If you’re planning a heist, having ‘someone on the inside’ is invaluable. And where I’d be now without Wates’ help doesn’t bear thinking about. For my first site tour, I’d been invited to join the official inspection party. Although a fantastic opportunity, the only snag was I was just a ‘tagger-on’ and delays meant the tour lasted only 25 minutes. For someone like me who wanted to soak it all in, this meant I ended up missing out completely on the top floor of the building. However, six weeks – & many new friends – later Wates were the game-changers. 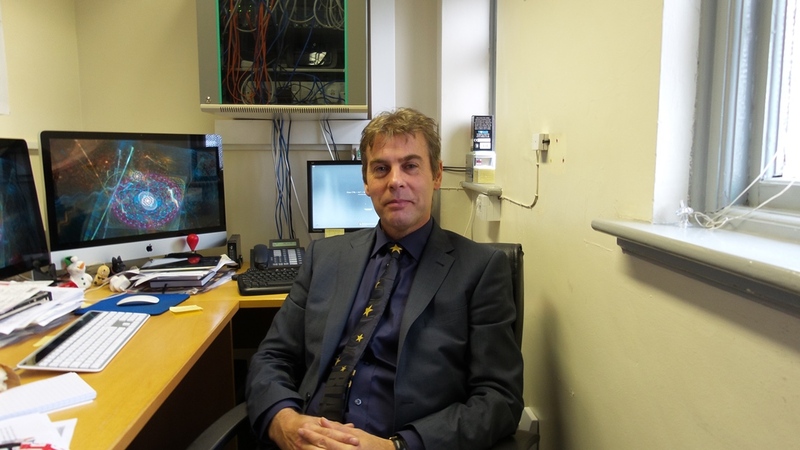 Meet Conal Stamp, Construction Technician. Aware the interior of the main building was changing all the time, one of the Wates team, Conal Stamp, kindly offered to give me a main building tour after my lunchtime photos on February 24th. His timing was ‘spot-on’ for me because, once inside, it was clear things had moved on fast and it was a very good time to visit the top floor too. Conal took me all around the building and, most importantly, allowed me to photograph new additions and old features newly exposed at my own pace. 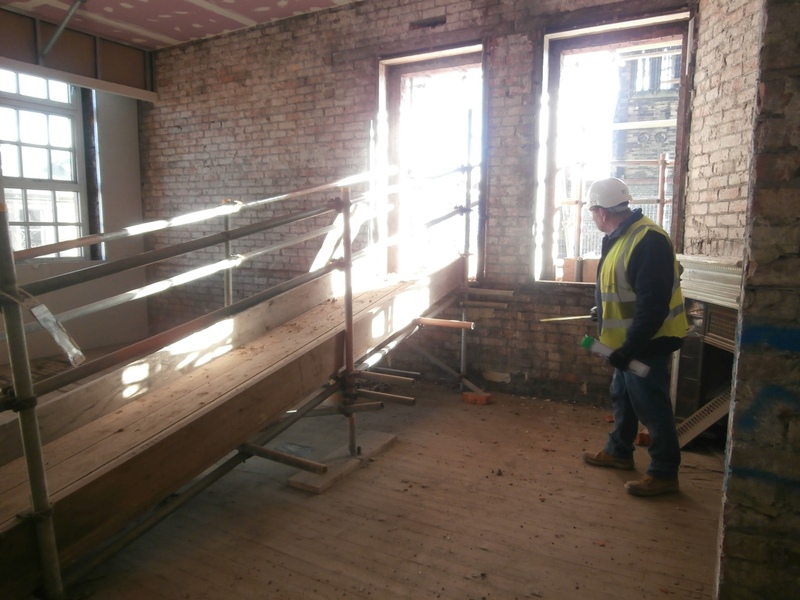 This allowed an invaluable record of this amazing building at a pivotal point in its renovation: with its new layout now in place yet still stripped back to its original features; largely uncluttered by new building materials and also in bright sunshine. The Biology Lab bathed in sunlight: the greenhouse is staying. I took over 150 photographs that afternoon which have now been linked together at the end of this post to re-create the feeling of an eight minute walk around the regenerating old Church High building. It’s important to let you see things for yourself, I think. However I do intend to focus on the area of greatest change, the top corridor, in the next few posts. But for now, the rest of today’s post will point out for you the most note-worthy things I saw that day. My tour this time began at the back of the building, entering through the glass door at the very back of the modern 1998 Barbour Wing. Walking past the Home Economics room to the left, it was clear that the main activity on site at the moment was plumbing. 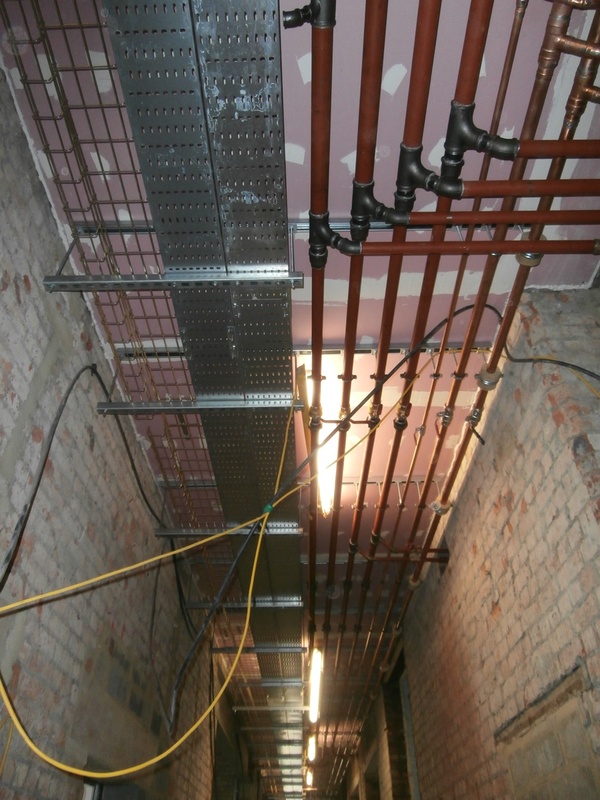 Apparently, modern building regulations require all pipework to run over-head not under the floor, so travelling along all the corridor ceilings was a complex, weirdly-beautiful network of bright copper piping. Overhead, on the ceiling of all the main corridors a complex and intricately-beautiful network of pipework has been introduced. 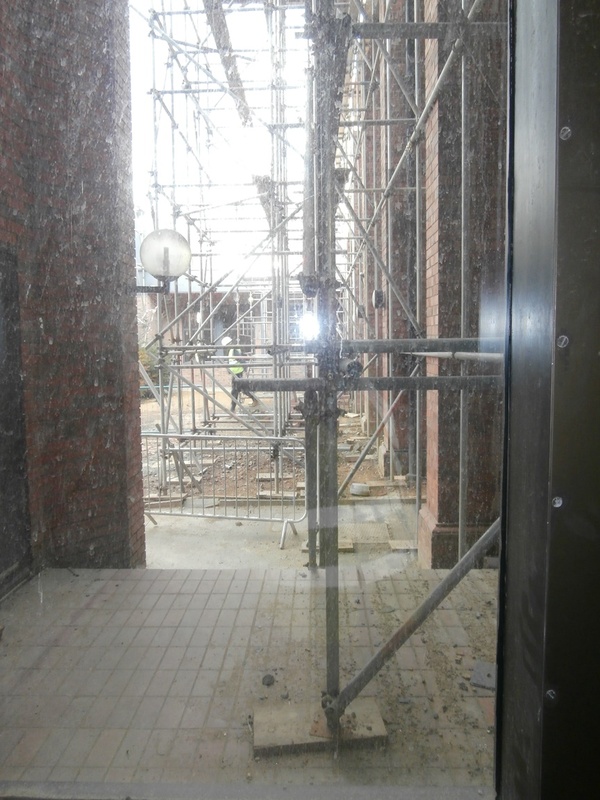 Through the glass of both modern extensions at the back of the building, the quadrangle presented as a maze of scaffolding poles. 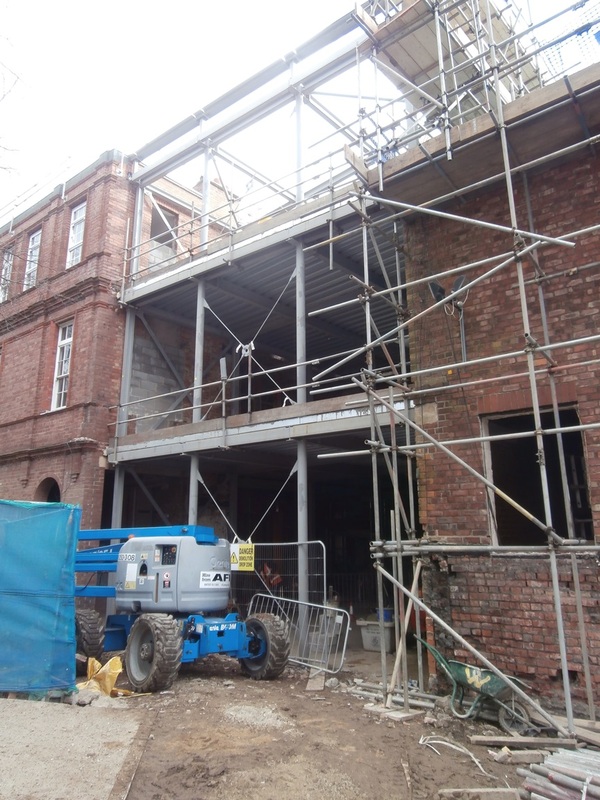 The quadrangle at the back is also now a maze of inter-linked metal scaffolding poles. 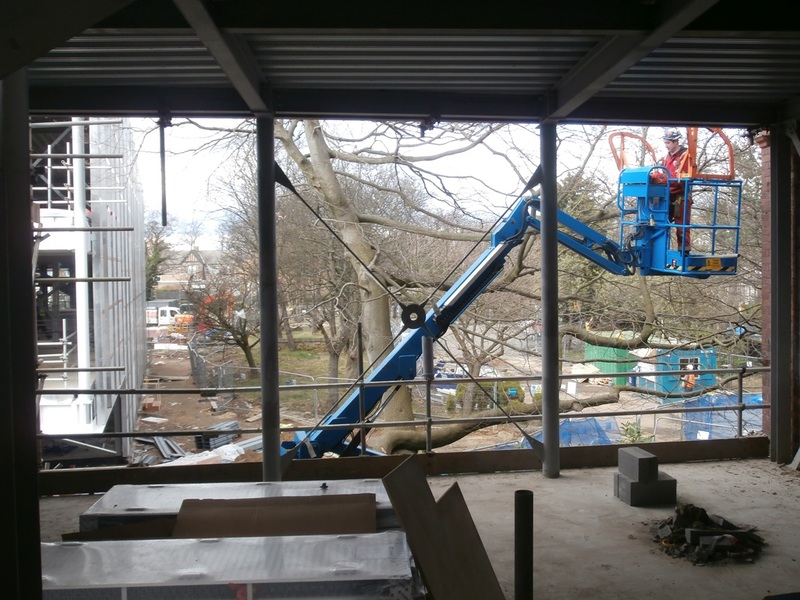 The new extension is still without its glass at the moment, but it’s clear the new classrooms on the first and second floors are going to both have a fantastic view of the upper branches of the oldest tree. 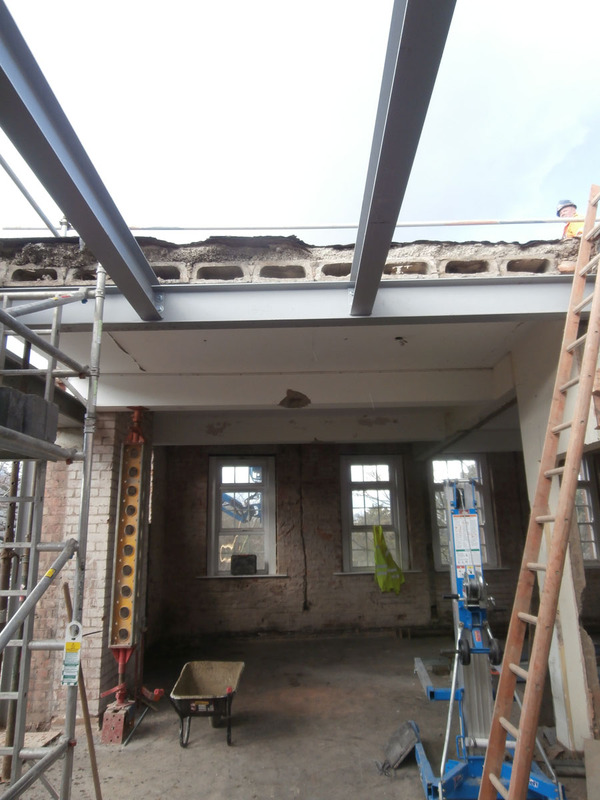 My first view of the new extension from within the building. I don’t know what was most exciting at this point of my tour – the fact I was now looking at something I had only previously seen from outside or that I was actually walking down the new concrete stairs! 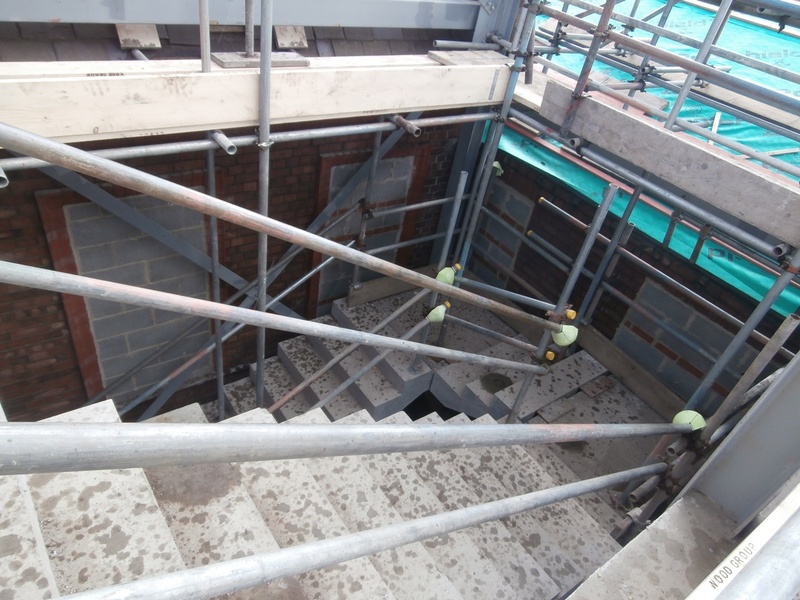 I was amazed to be walking down the new concrete stairs. But it was the old that took my eye as much as the new on this occasion. 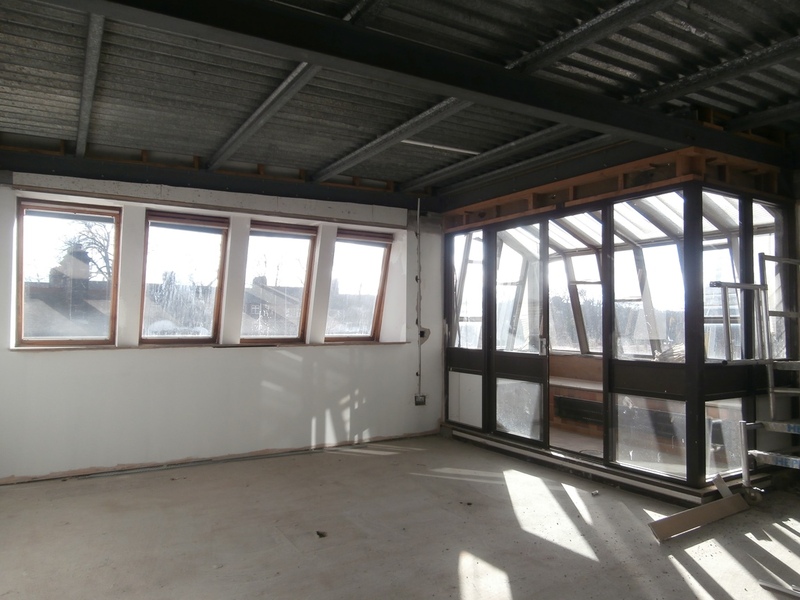 I knew from six weeks ago that the distinctive glass-panelled doors of the first floor classrooms were being retained, which was really good news as they give the main corridor such character. 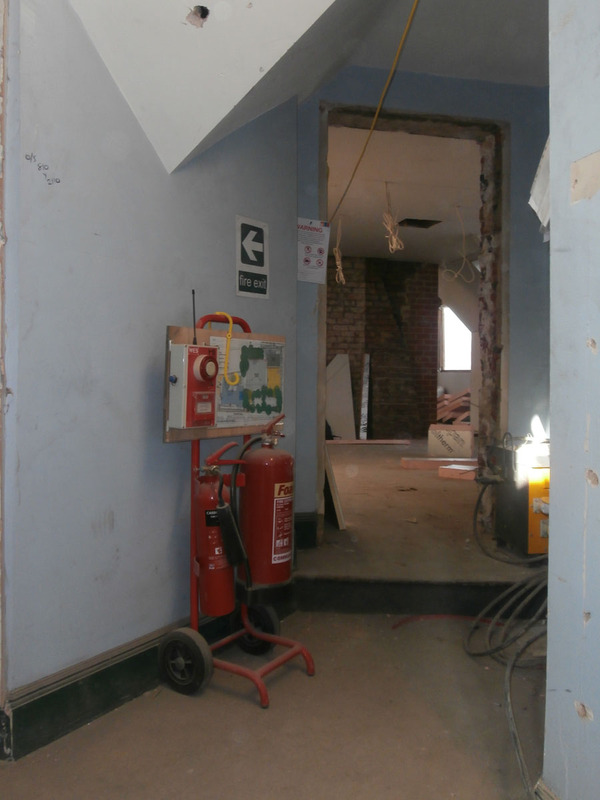 What I hadn’t expected was the fact that, despite the last room on the left of this corridor (most recently Maths Room 7) being destined to contain a toilet now, the original corner fire-place uncovered during the site-enabling works will definitely be worked into the new room design. It’s going to be a lovely quirky feature. 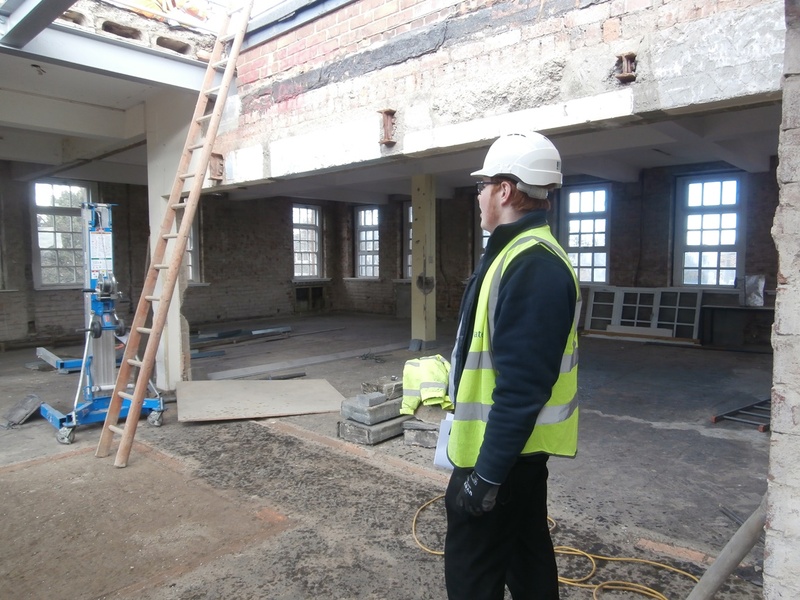 In Room 7, Colin Gordon, who manages all mechanical things, is working out where a new toilet is going to be installed. 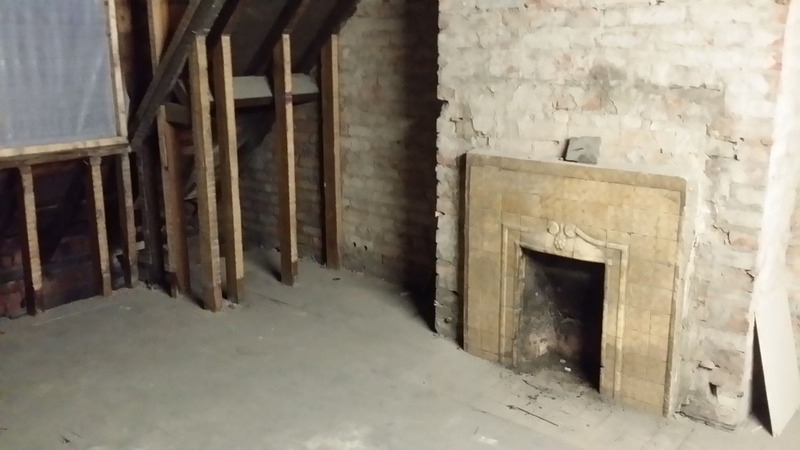 It’s going to be a bit of a squeeze, but the plan is the newly-exposed fire-place will somehow be incorporated into the toilet. Walking up the only remaining original flight of stairs to the south of the building, I noted the full form of the funny little semi-circular fanlight at floor level was now exposed in a very beautiful manner. 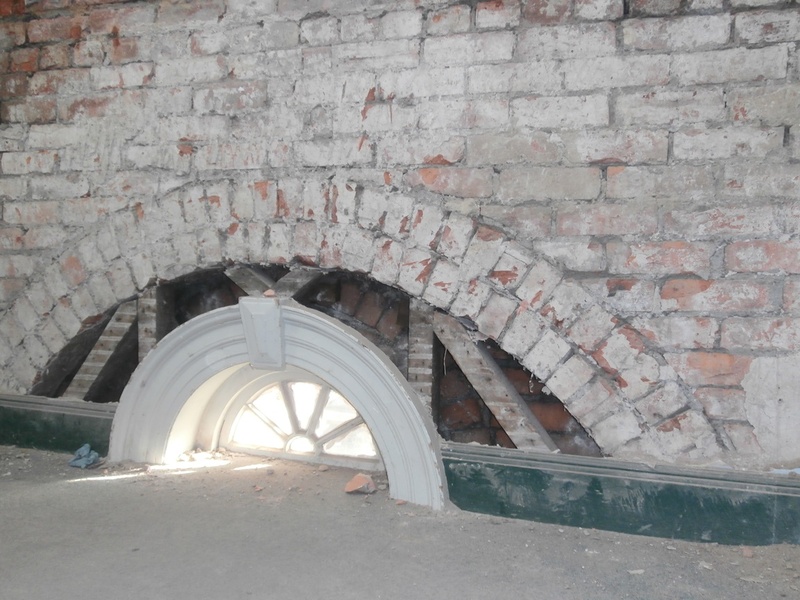 With the walls stripped back, the structure of the unusual semi-circular fanlight at foot level is fascinatingly exposed. The brickwork arch now exposed above it made me question the purpose of this odd little feature of the south stairs more closely than I had ever previously done. It was only when I got home and looked at exterior shots of the side doorway that the whole window structure became clear to me. Discoveries like this are fascinating. From the outside, it’s clear the little ‘foot-light’ is actually the top-most transept window. 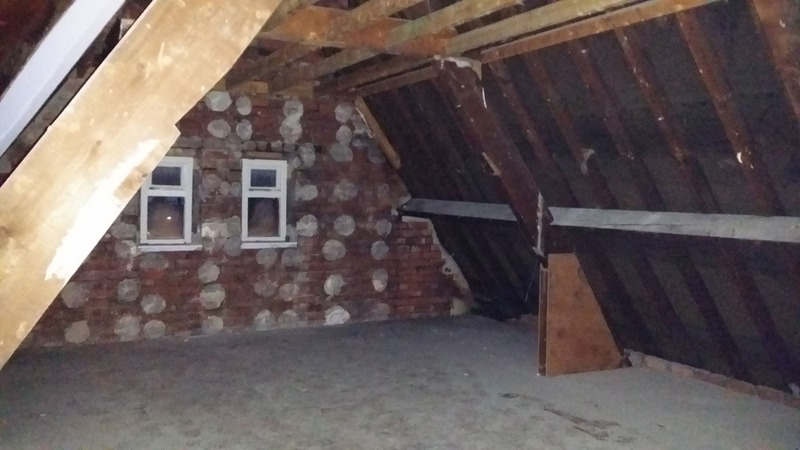 On the top floor, I knew the administrative offices had all been knocked through, but the exposed rafters and beams now made it clear these rooms really had been cut into the eaves – and quite literally so as a later conversation with a joiner would make clear. 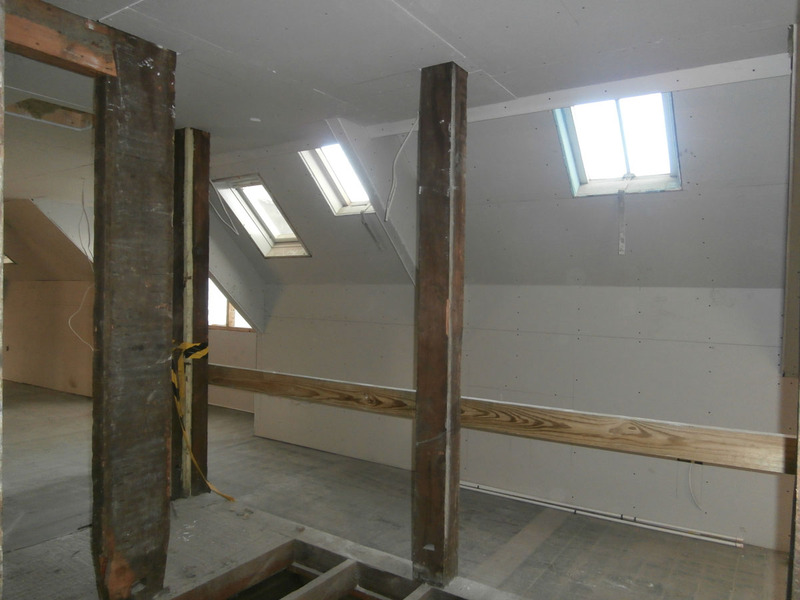 When the dormer windows were put in, it seems the king posts were all just cut out. 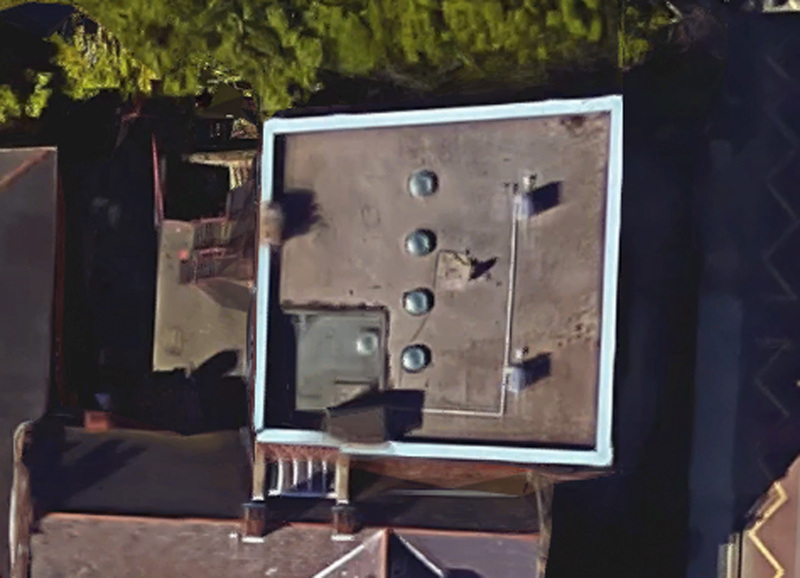 This building has undergone radical change before. 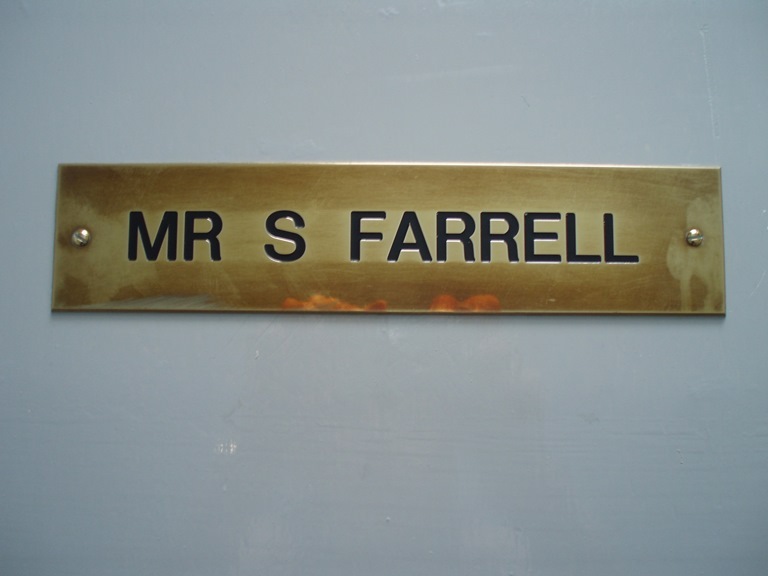 Having said that, even this knowledge didn’t prepare me for the fact that at the far end of the top corridor not only was Steven Farrell’s IT Manager’s Office – formerly the old School Sickbay – no longer there in any form any more , that whole area also now had no roof! The site of the IT Manager’s Office (formerly Sick Bay) is now only discernible by the brown L-shaped outline on the concrete floor. 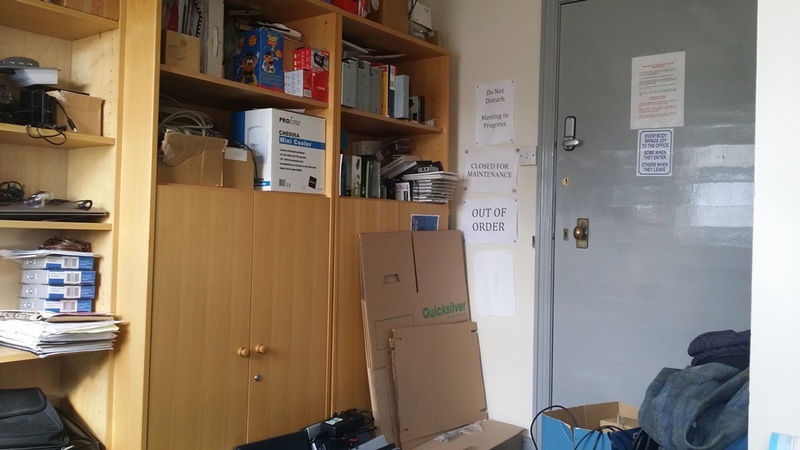 Conal is standing in front of the door to the old Staff IT area. 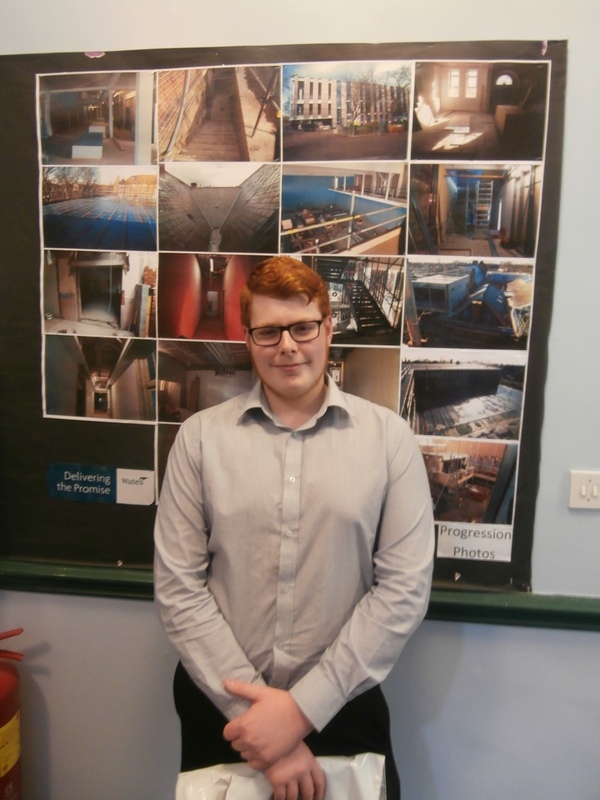 The radical changes to the top corridor layout deserve – and will receive, as I have said – more detailed explanation, but now I invite you to join me on a full tour of the building with Conal as our guide.